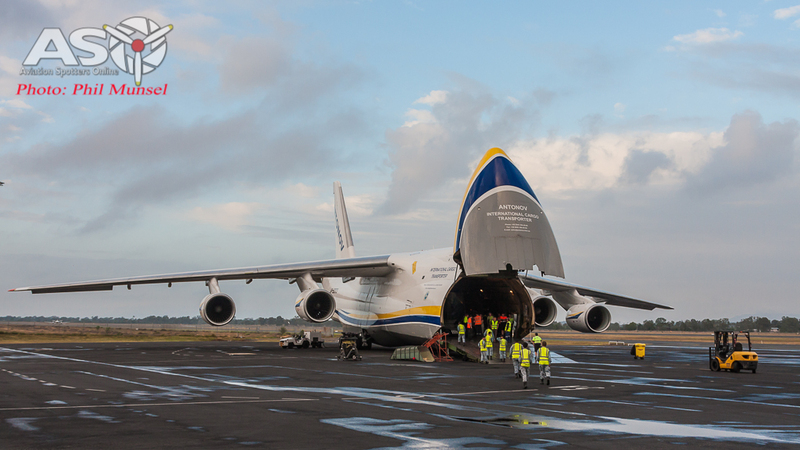 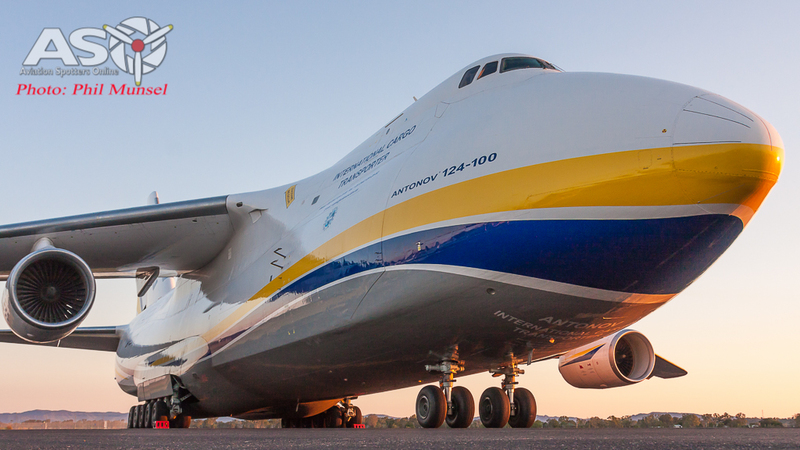 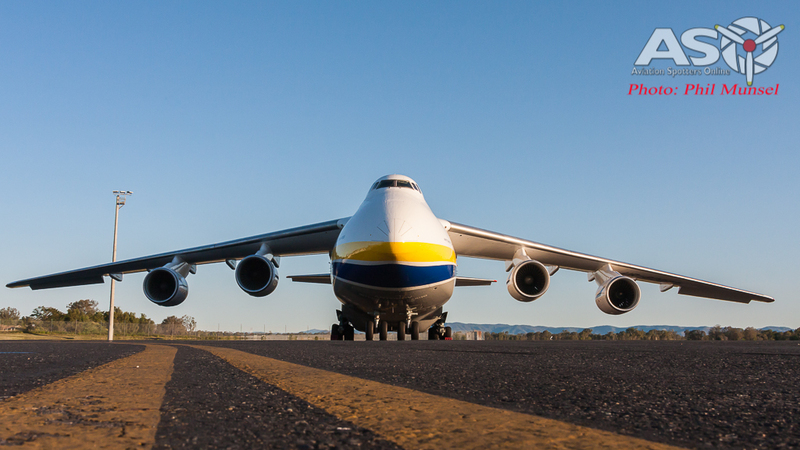 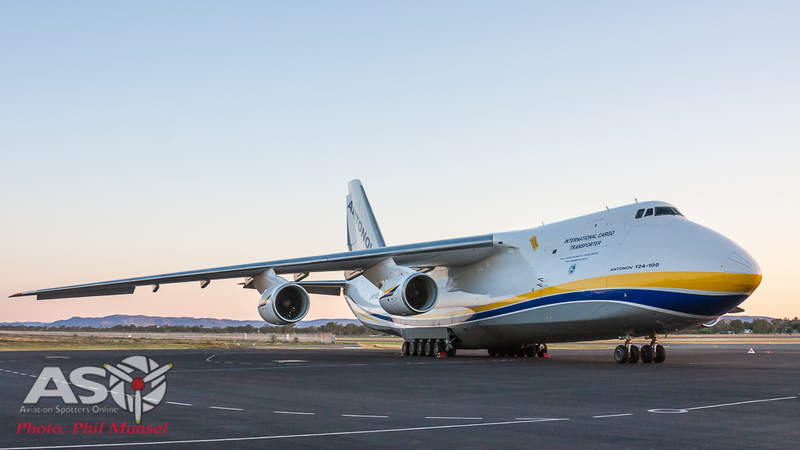 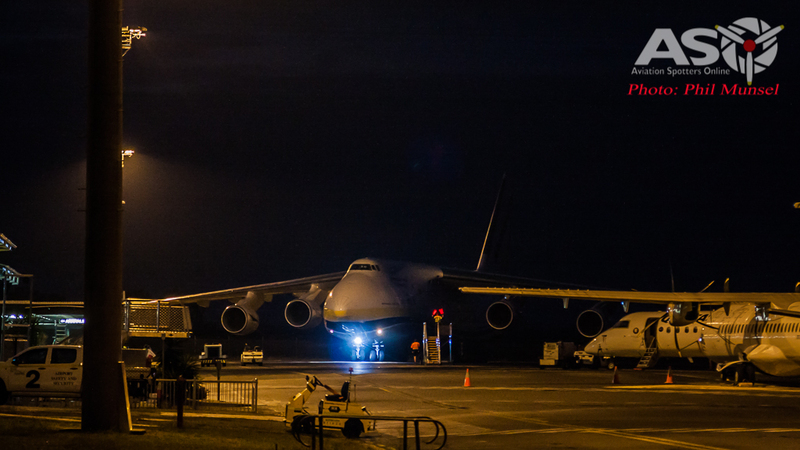 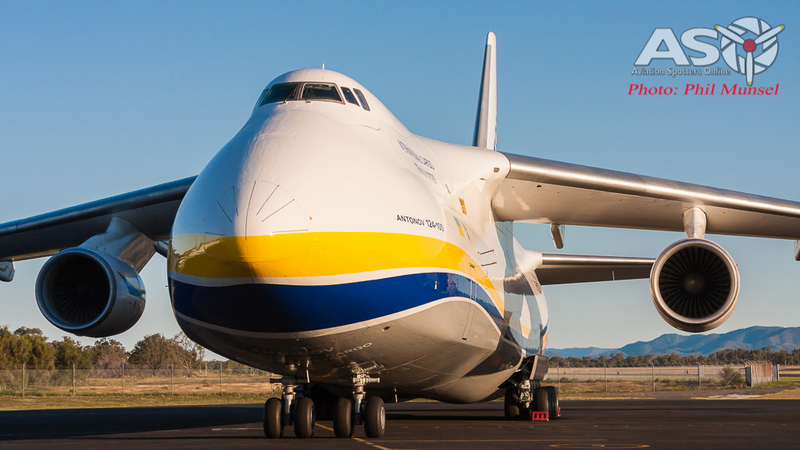 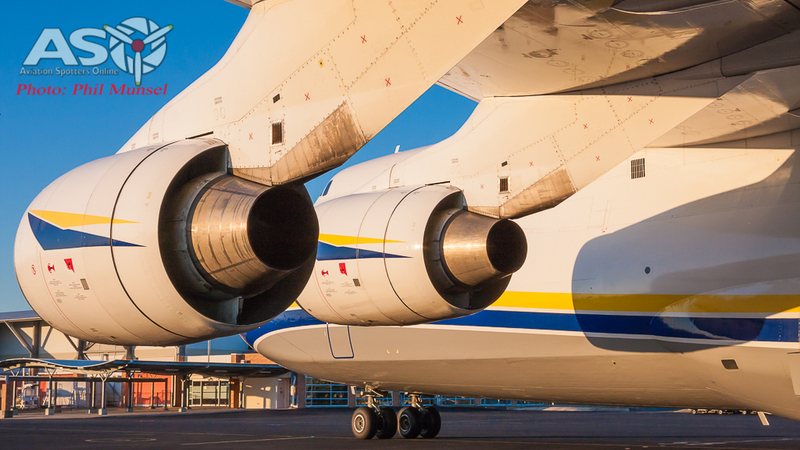 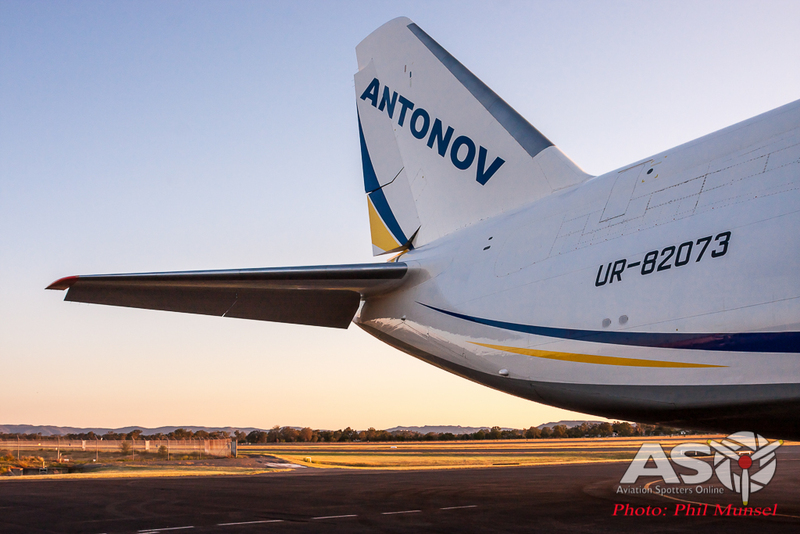 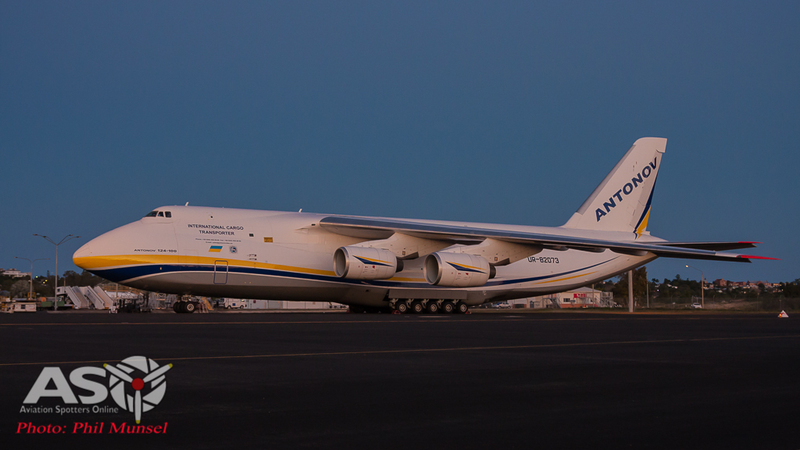 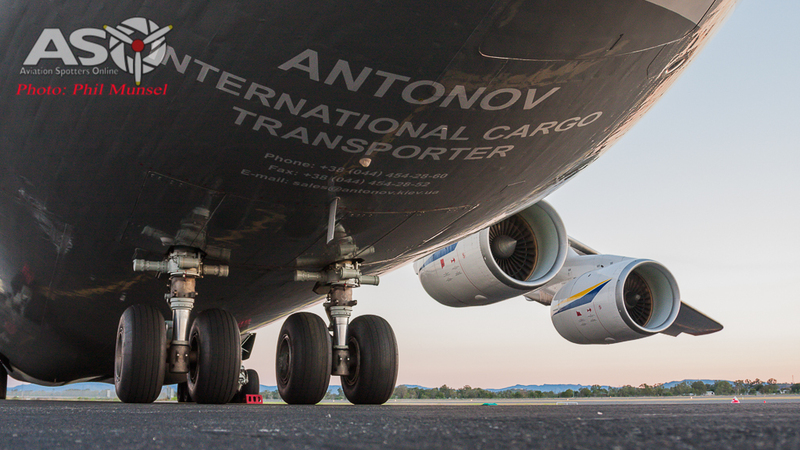 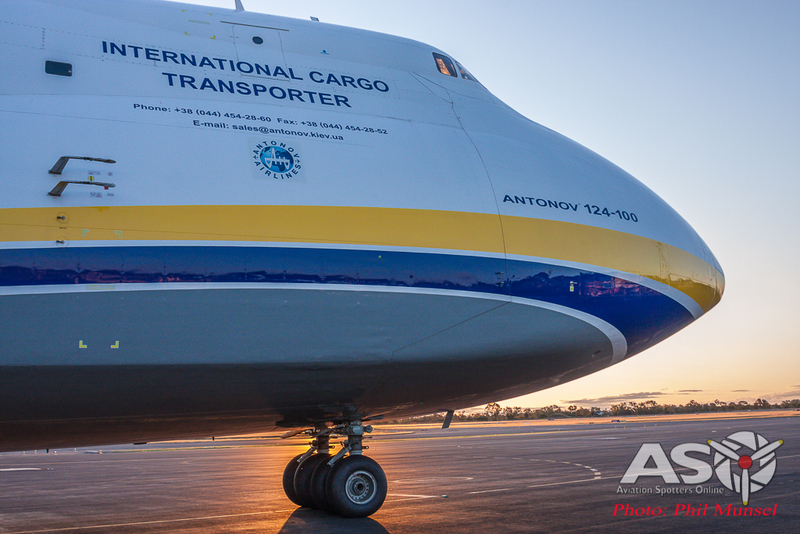 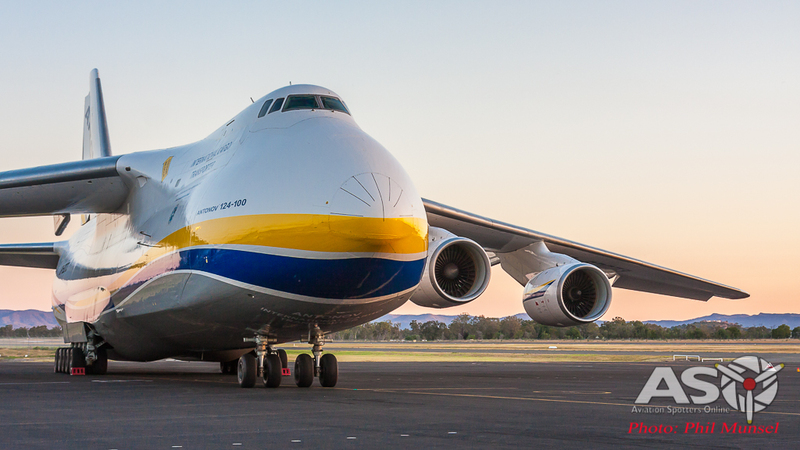 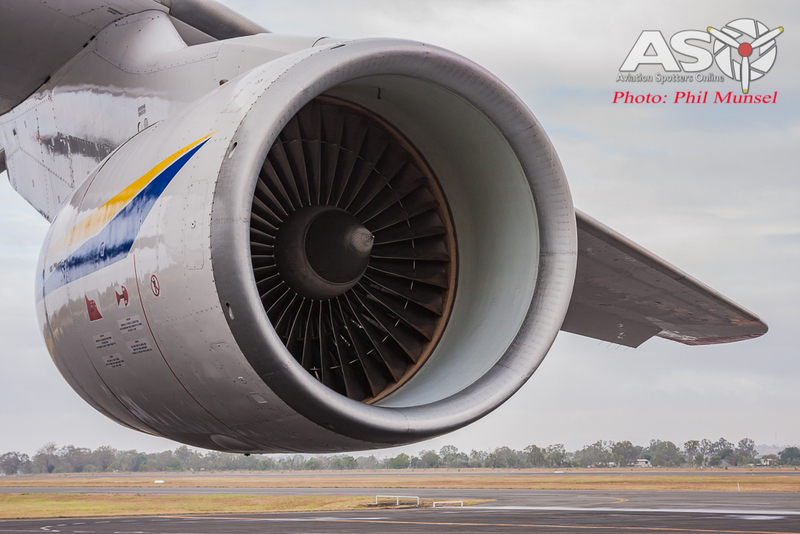 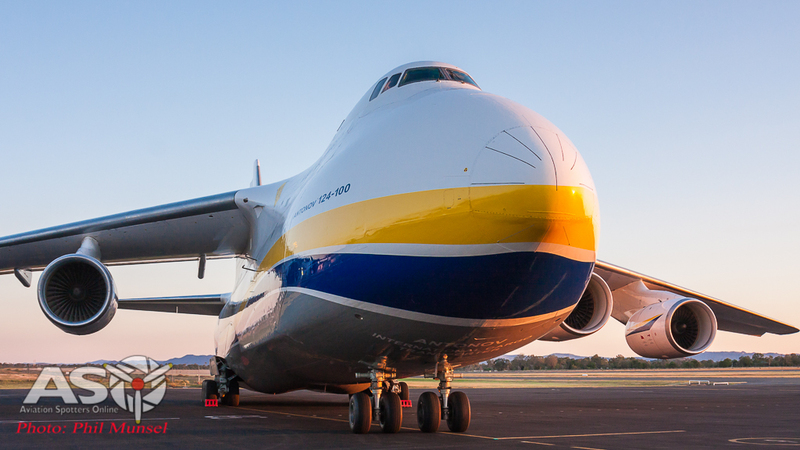 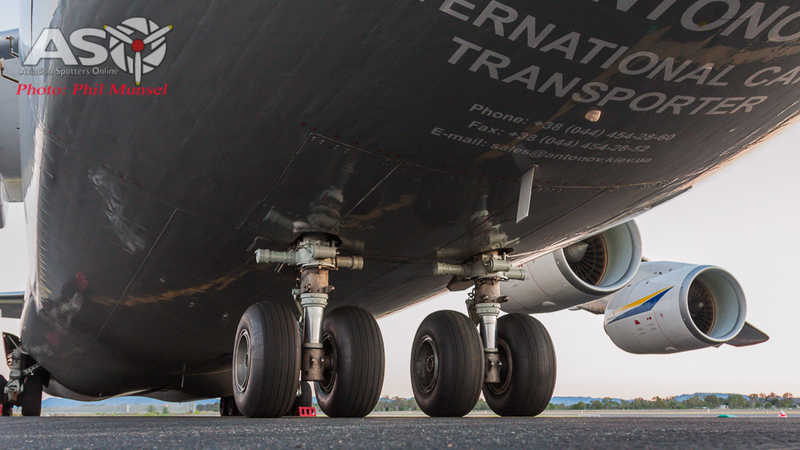 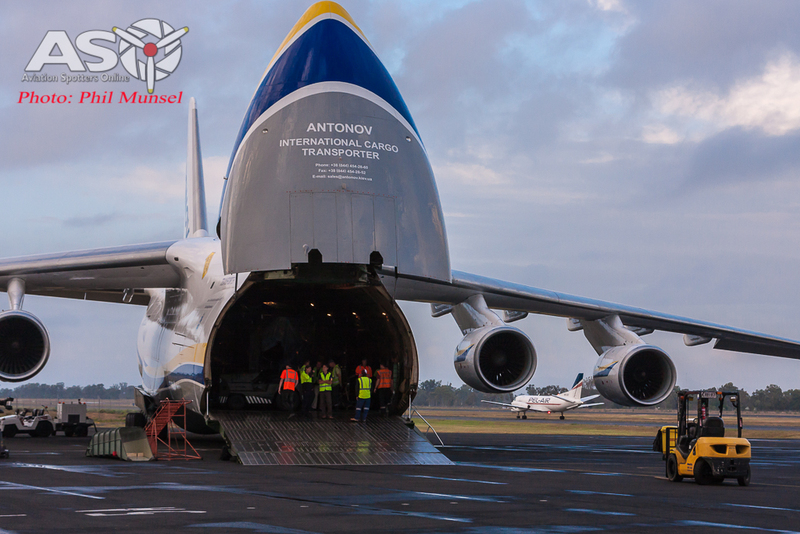 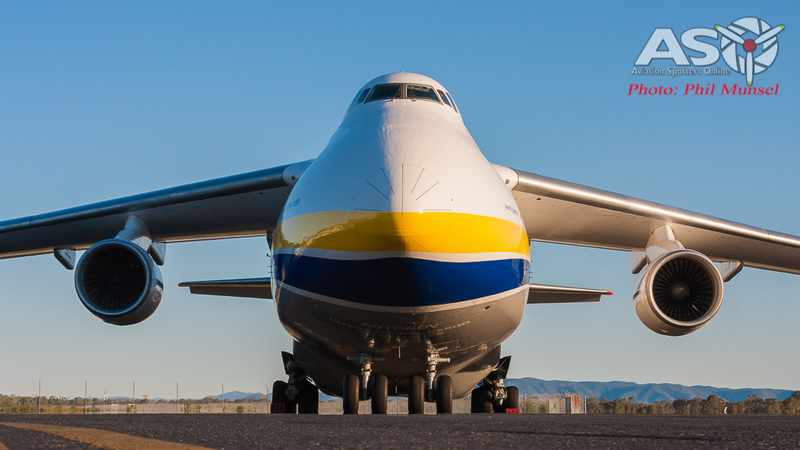 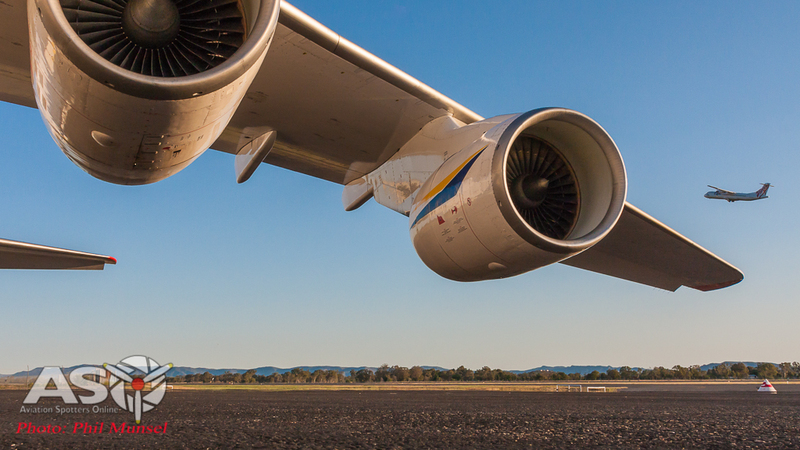 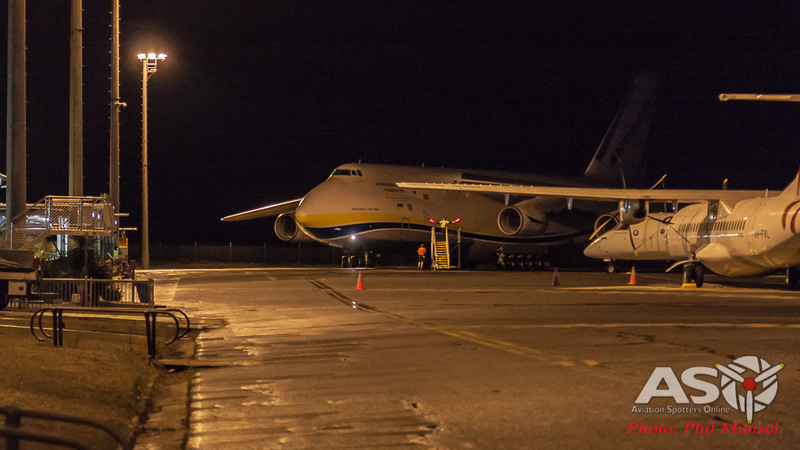 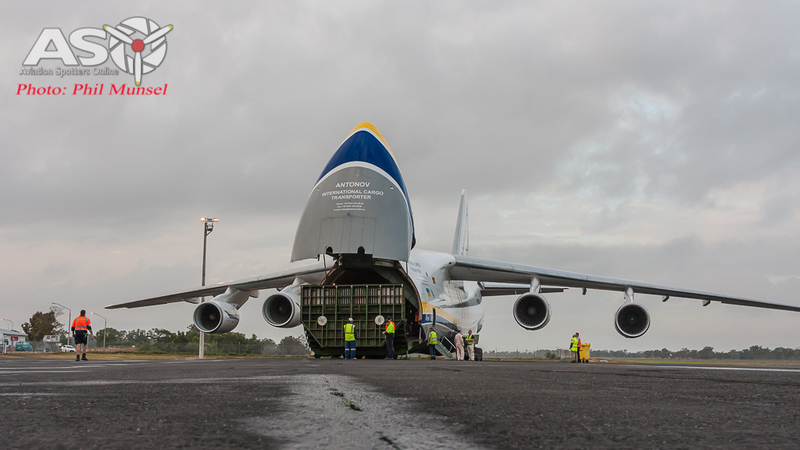 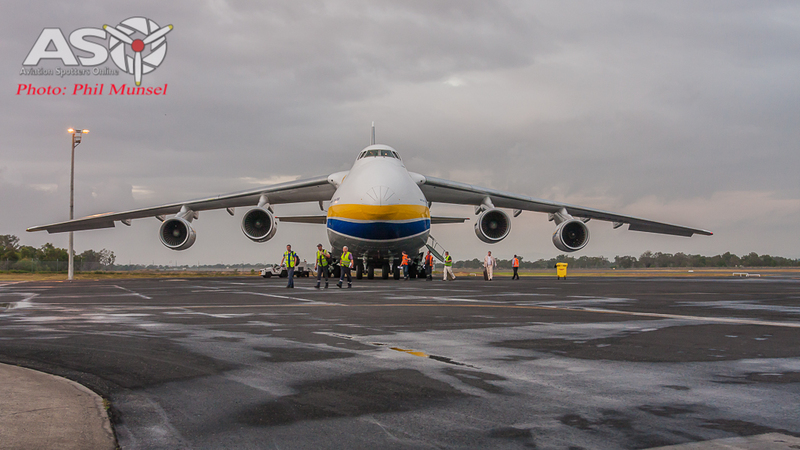 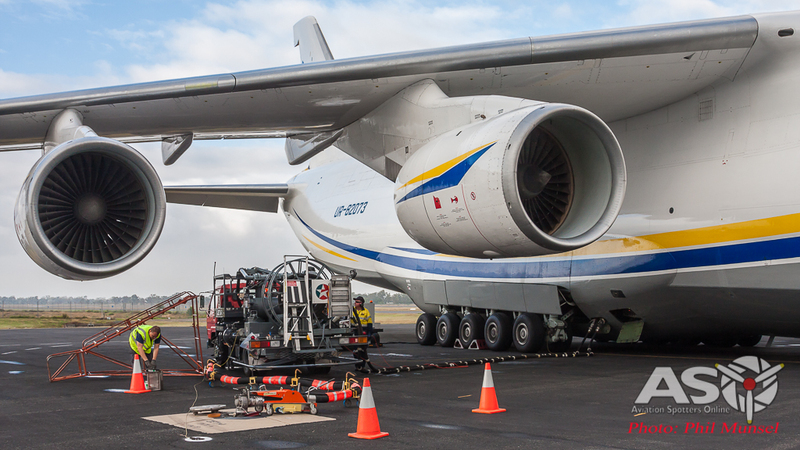 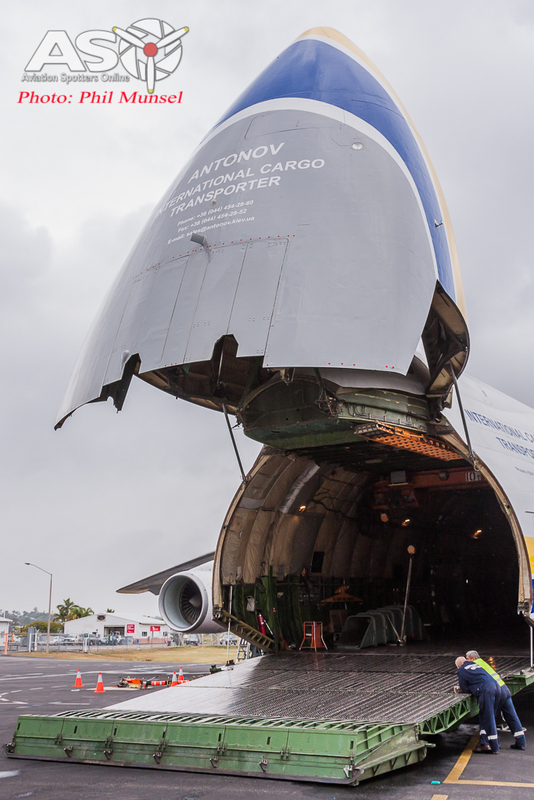 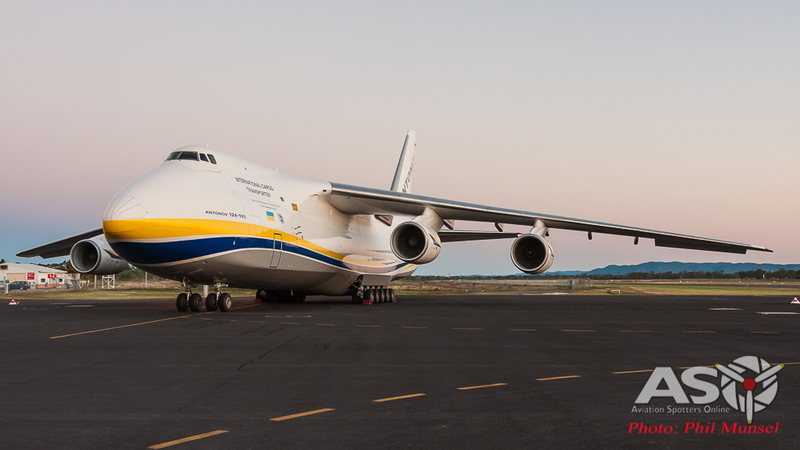 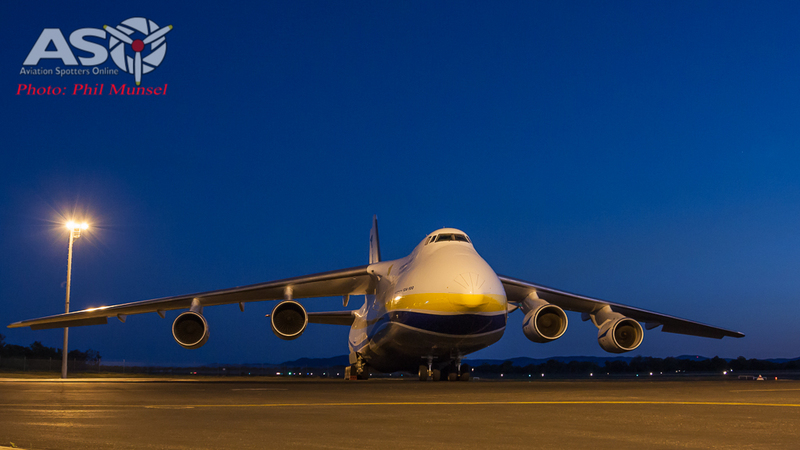 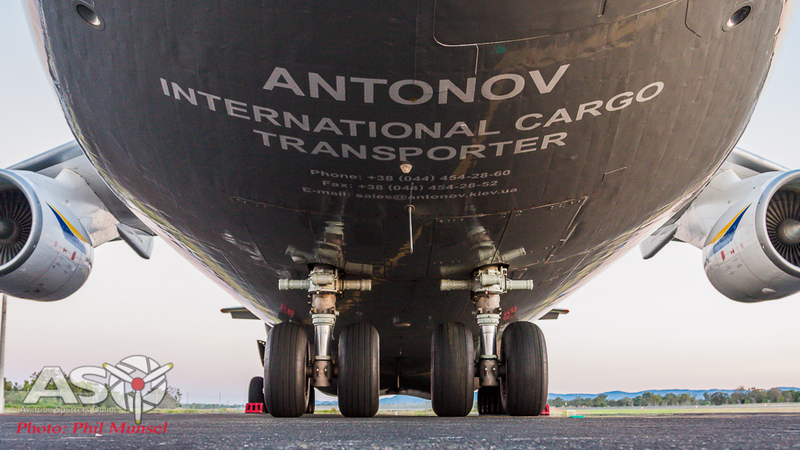 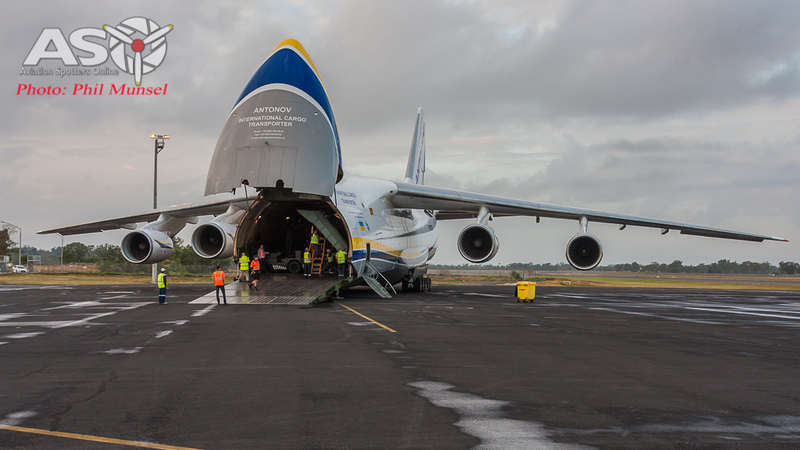 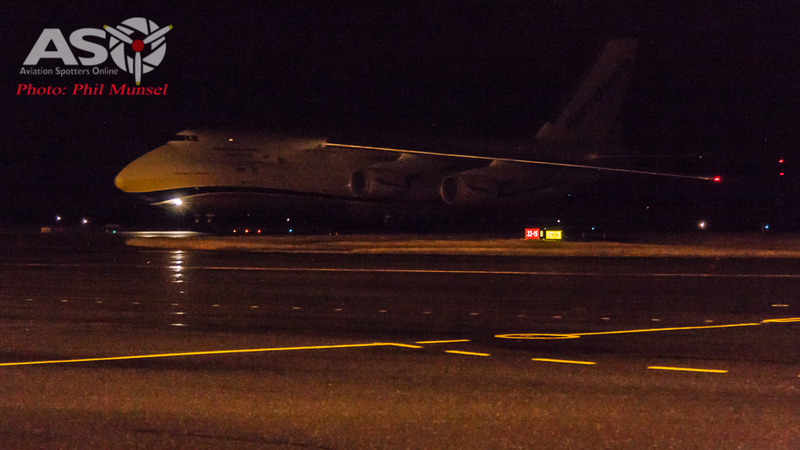 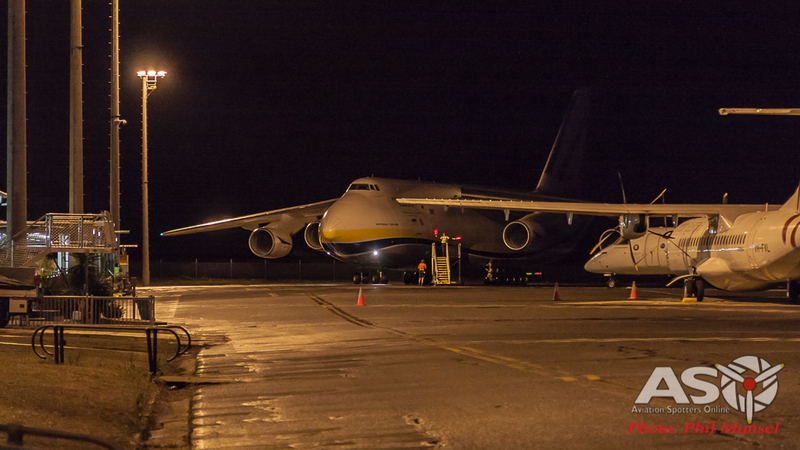 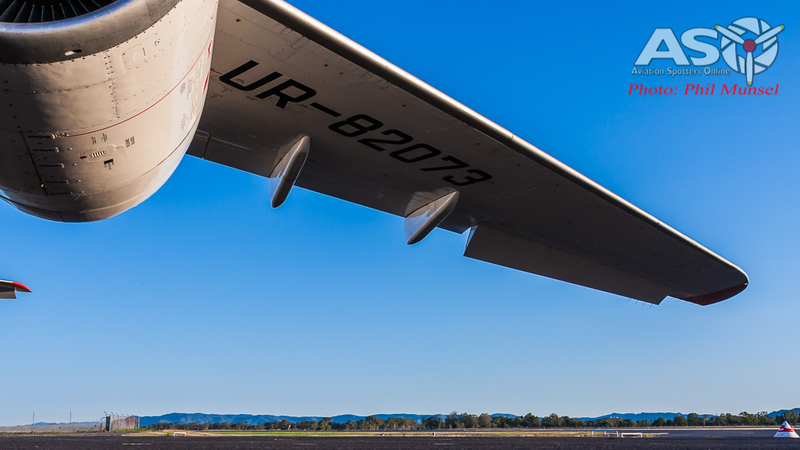 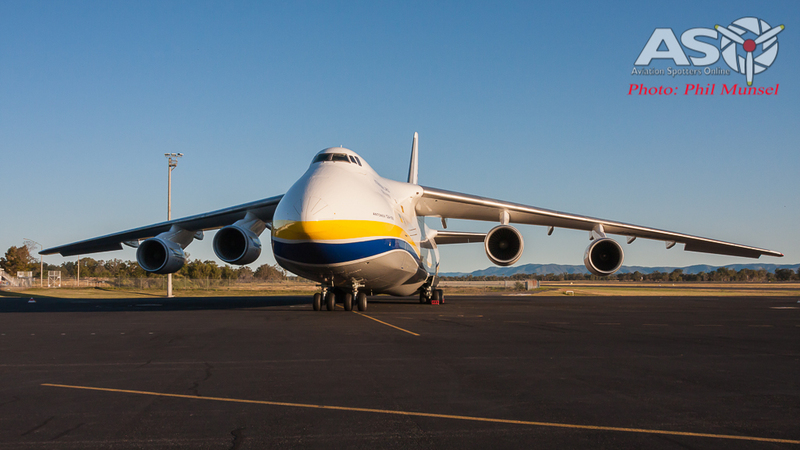 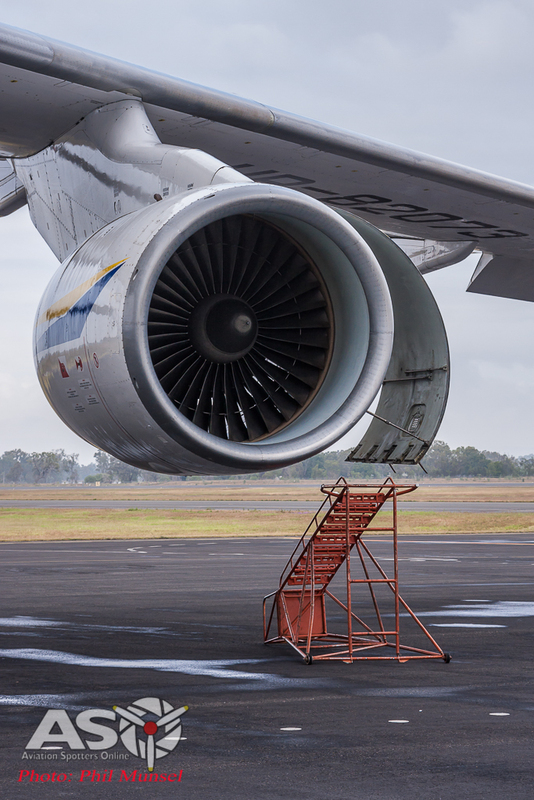 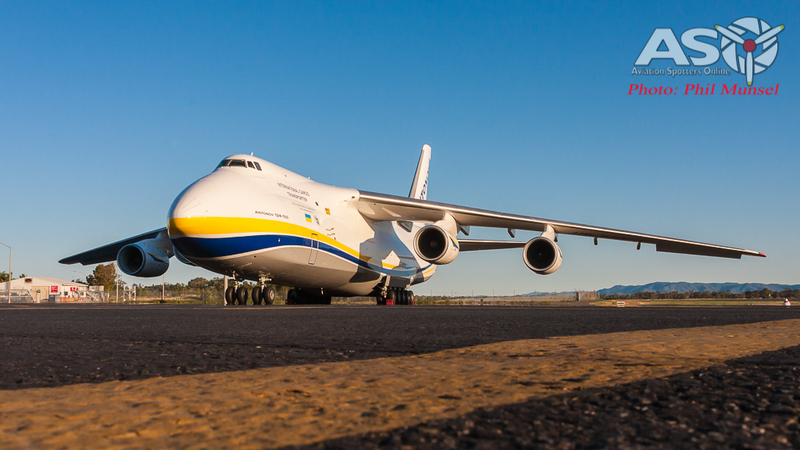 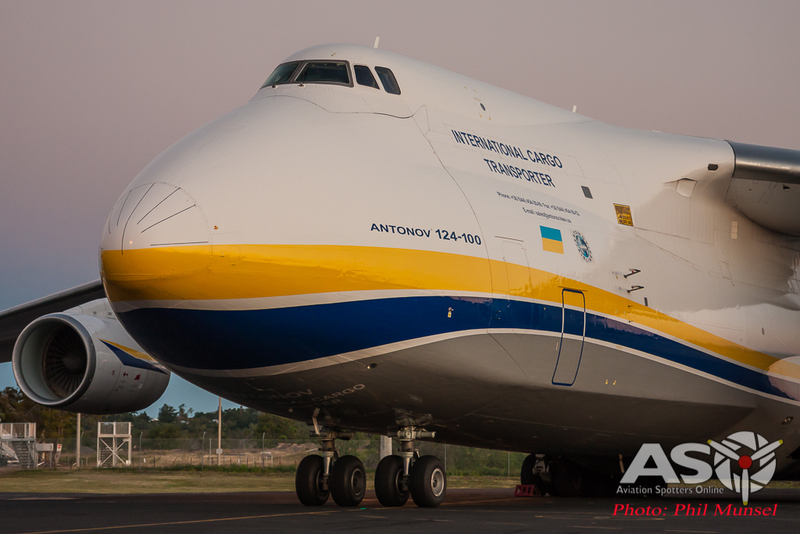 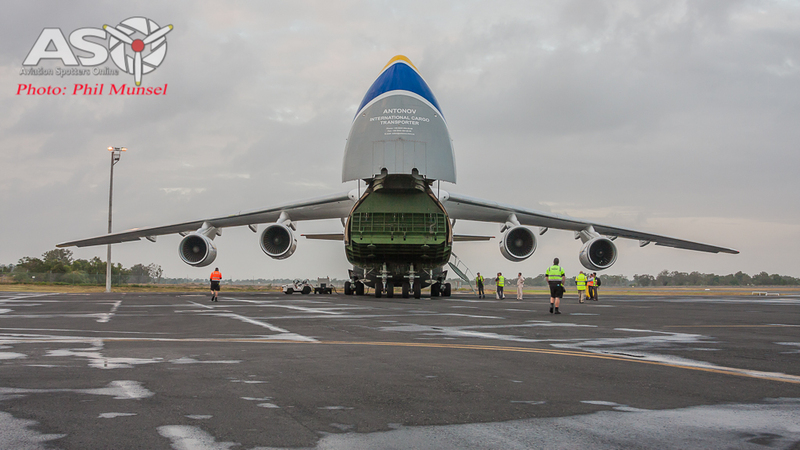 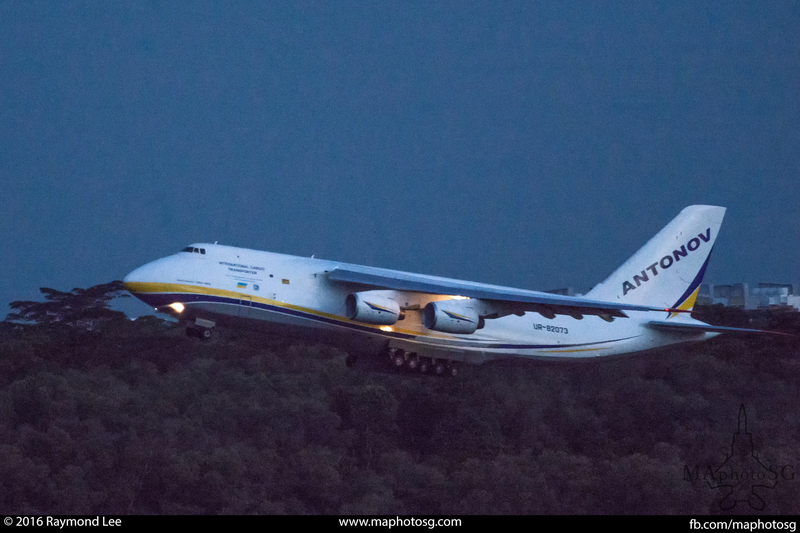 Antonov An-124 sits waiting at Rockhampton Airport for an early morning departure. 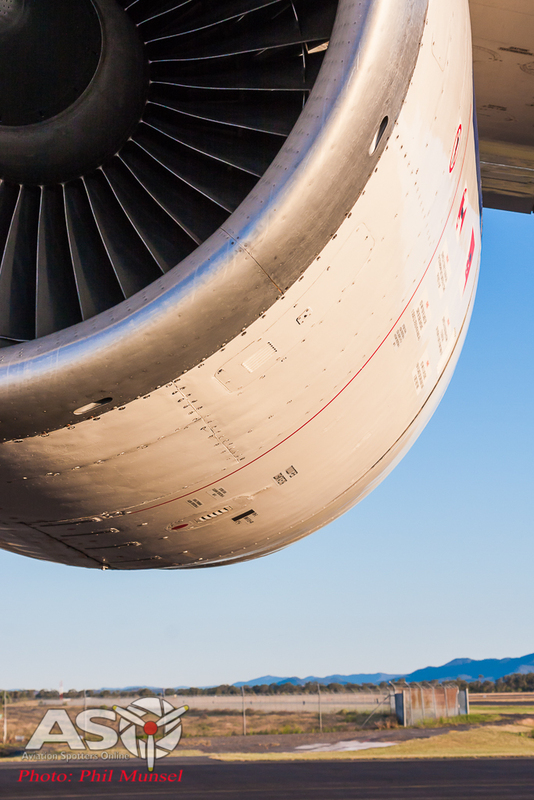 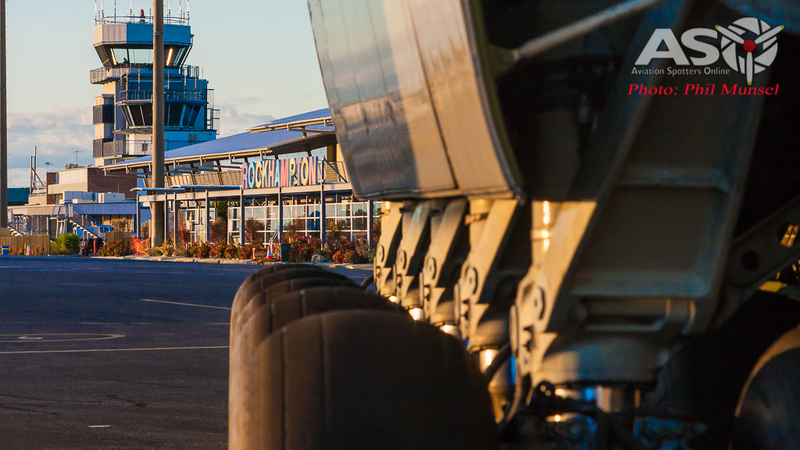 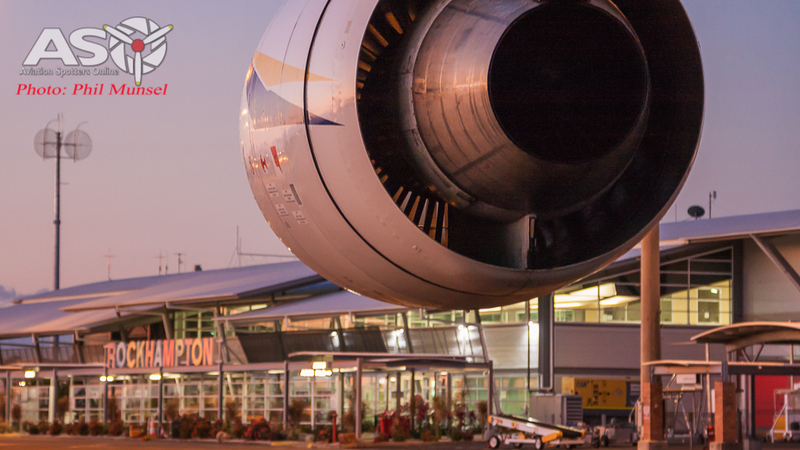 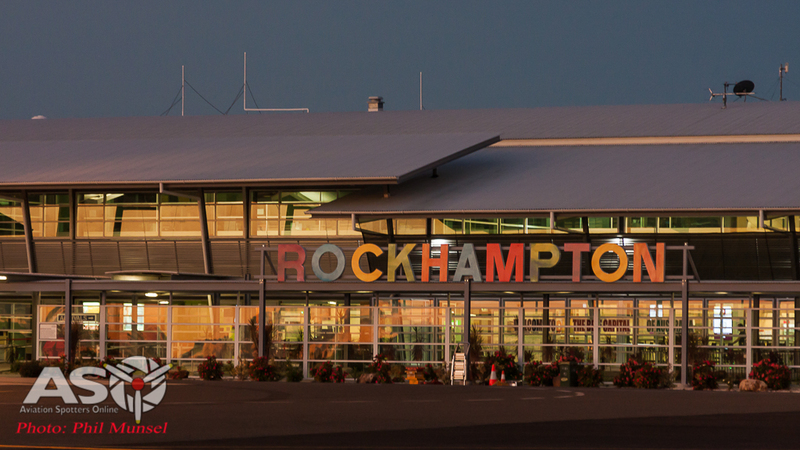 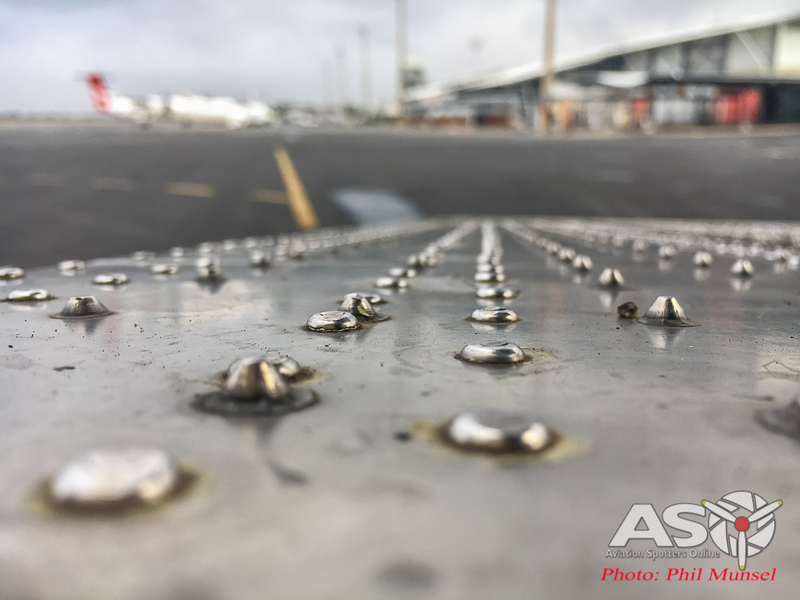 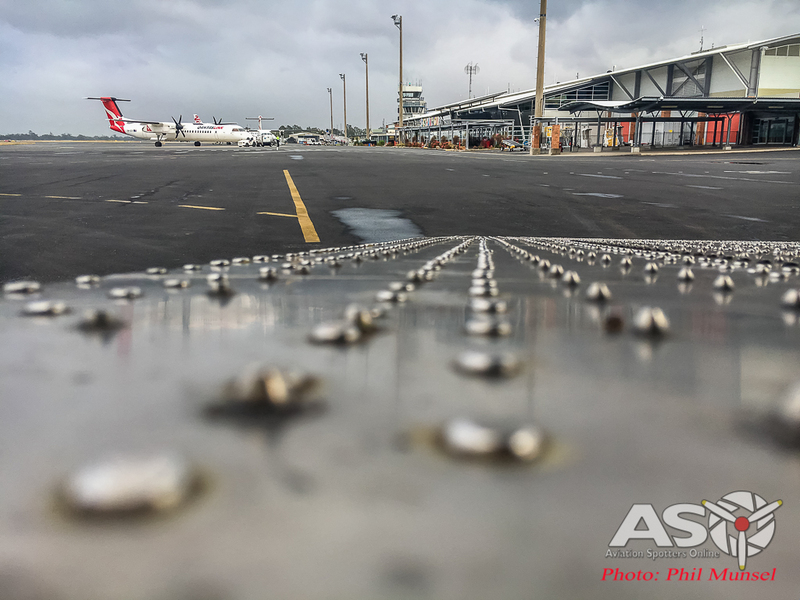 Rockhampton is located a short distance from the Central Queensland coast and has what is classed as a major Australian Regional Airport. 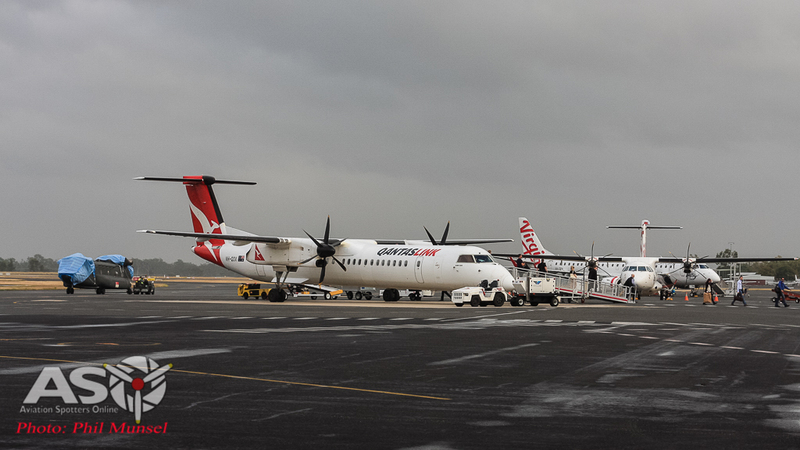 Rockhampton Airport services domestic flights from Cairns down to the Gold Coast and regularly hosts International charters as well diversions on its 2,568m long main runway. 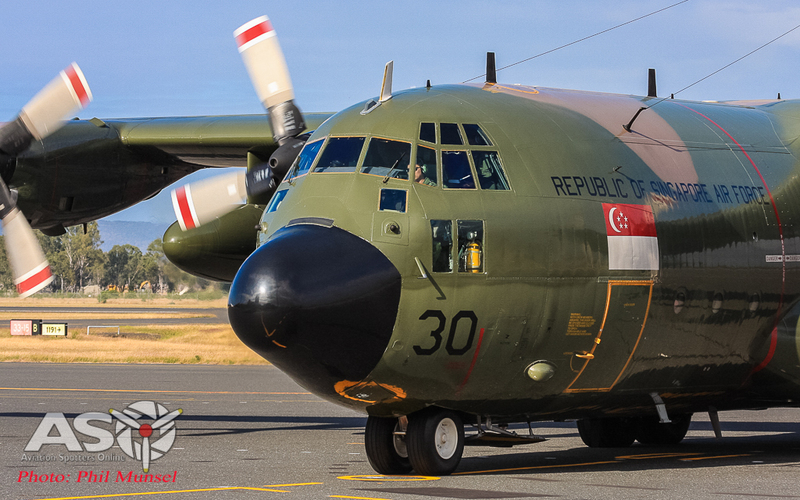 Singapore Armed Forces have been training out of Rockhampton on and off since 1975 and more so Exercise Wallaby has been one of their main annual operations in Australia conducting realistic training out of Shoalwater Bay just north east of the Beef Capital with last year being their 25th anniversary. 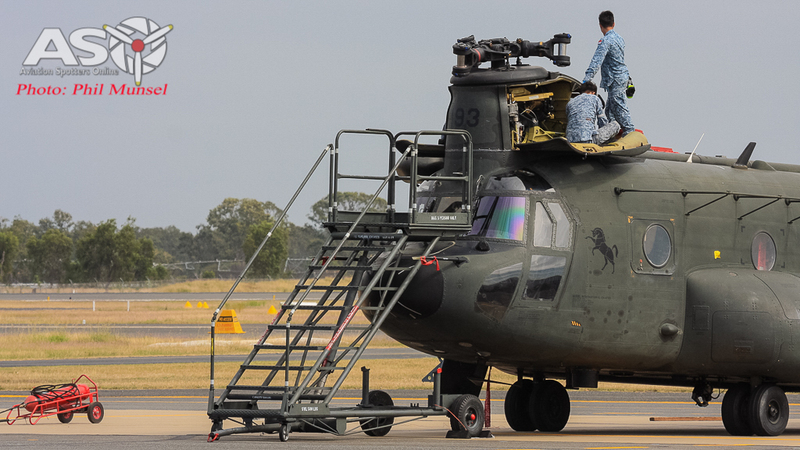 Good news has been recently announced that Singapore is increasing its ties with Australia here in the region of central and North Queensland by increasing the operations and troops training in the area. 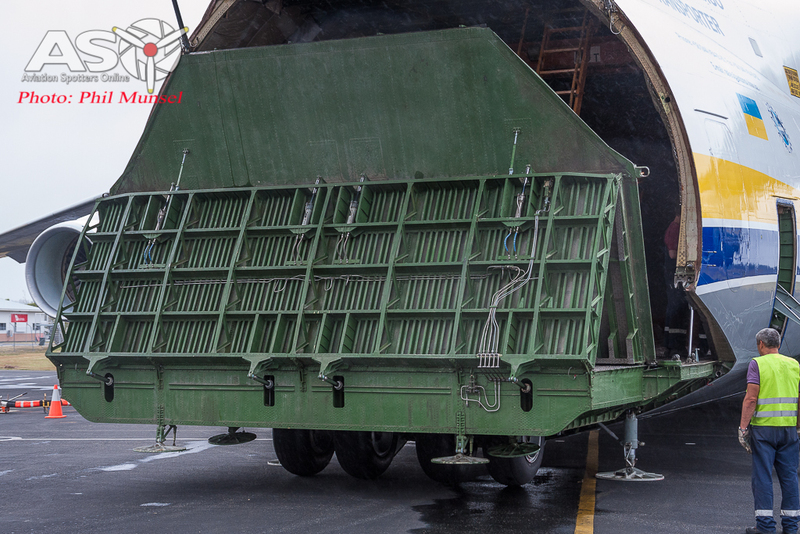 It is said that from 2017 they will conduct an extra exercise earlier in the year and increase total troops from 6000 to 14000. 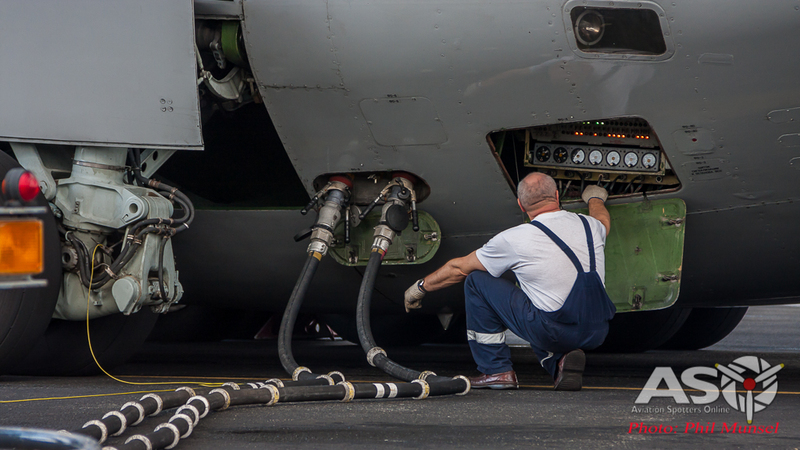 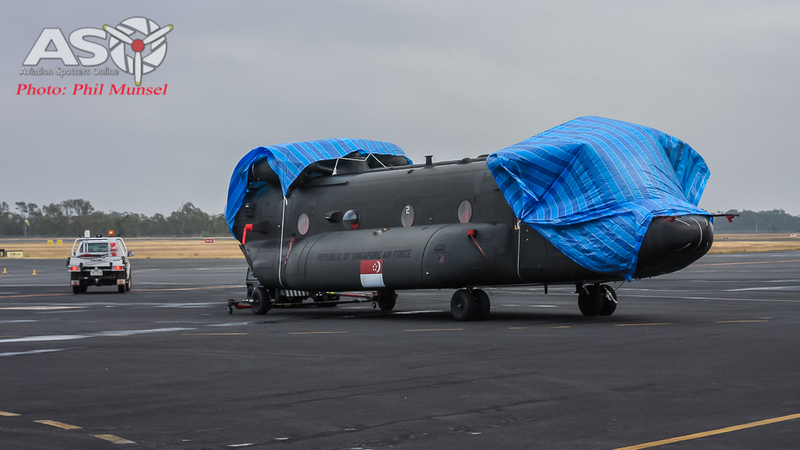 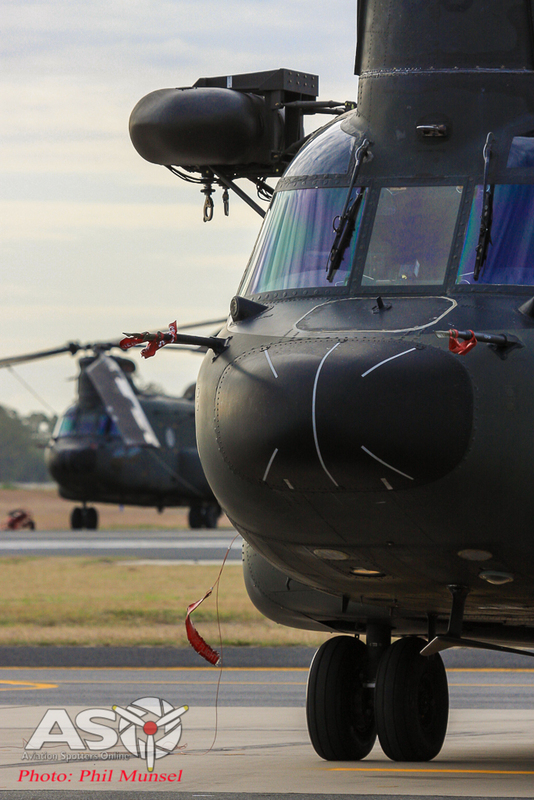 Up to 2 Billion dollars is being planned for upgrading infrastructure and upgrades to Shoalwater Bay Training Area (4 times the size of Singapore) over the coming period of 25 years. 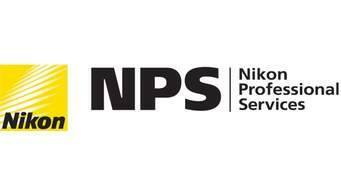 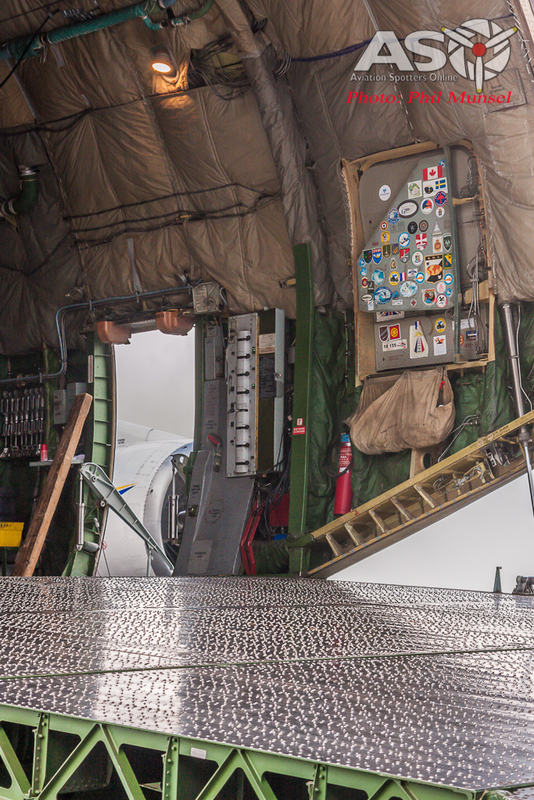 With every exercise brings a huge amount of equipment, personnel, food, supplies and planning. 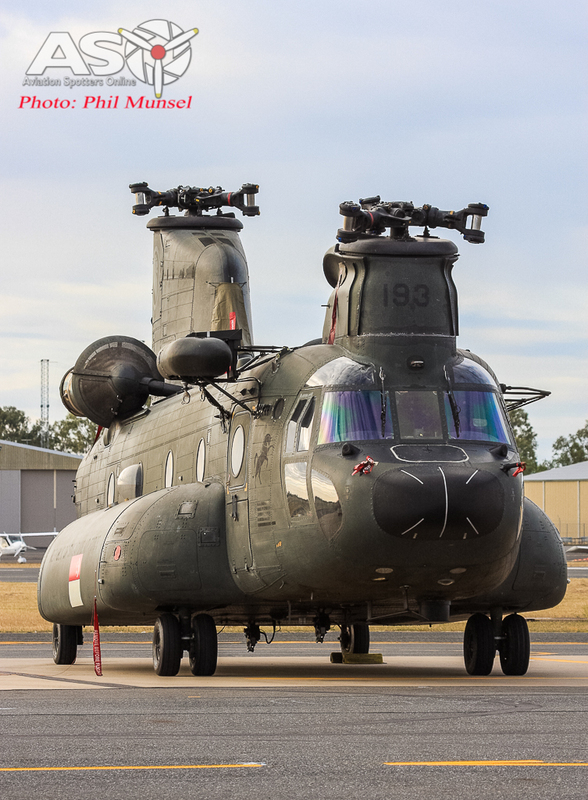 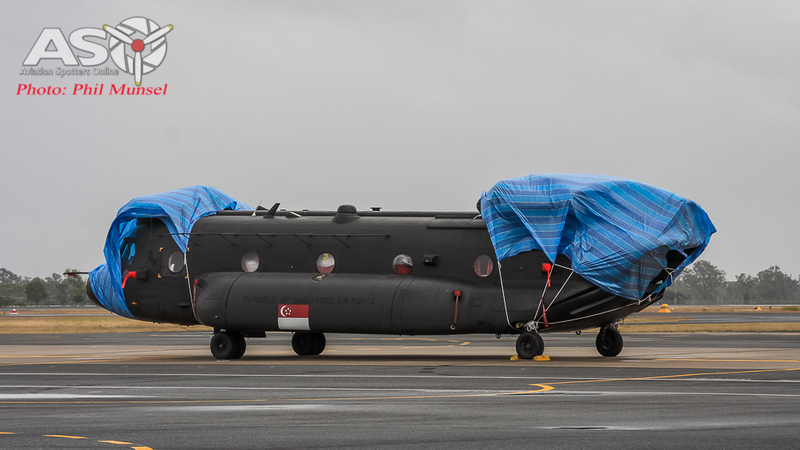 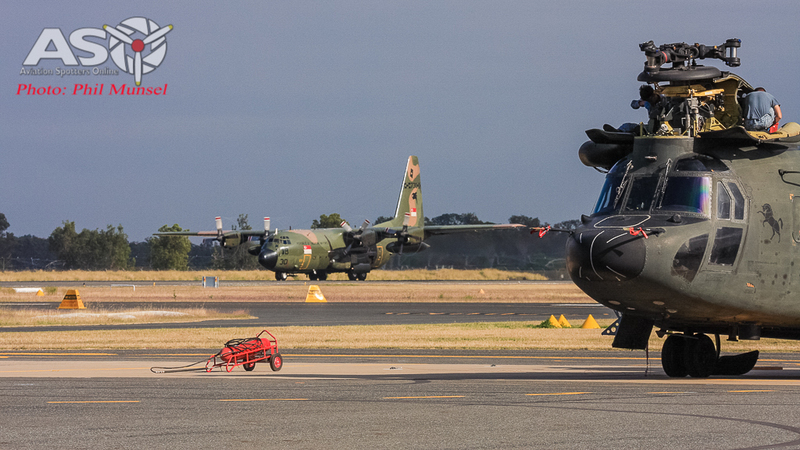 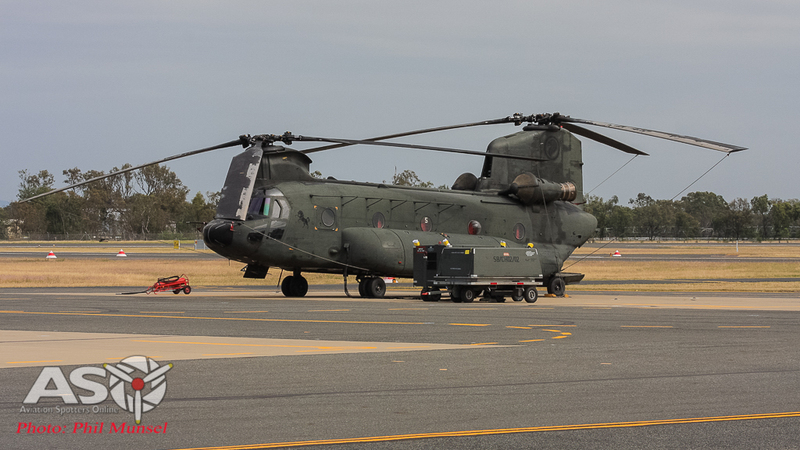 Moving a small part of their defence force for approximately 3 months is no small feat, with a start of 6000 troops 4x CH-47SD Chinooks, 4x AH-64D Apache’s, 6x AS332 Super Puma’s, 6x F-15SG’s and a 2x C-130’s comes with all its baggage! 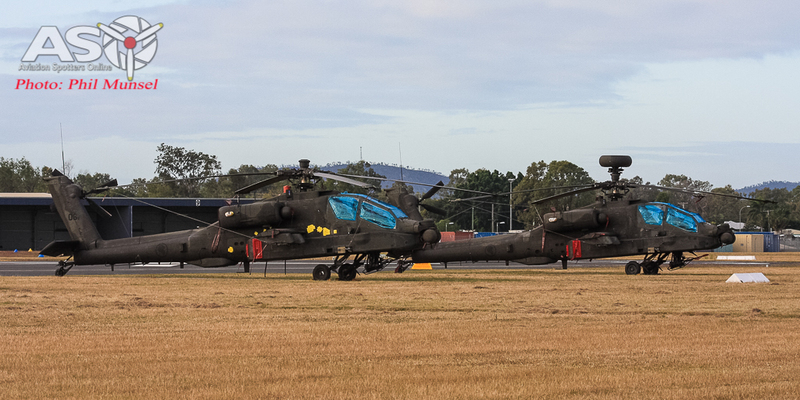 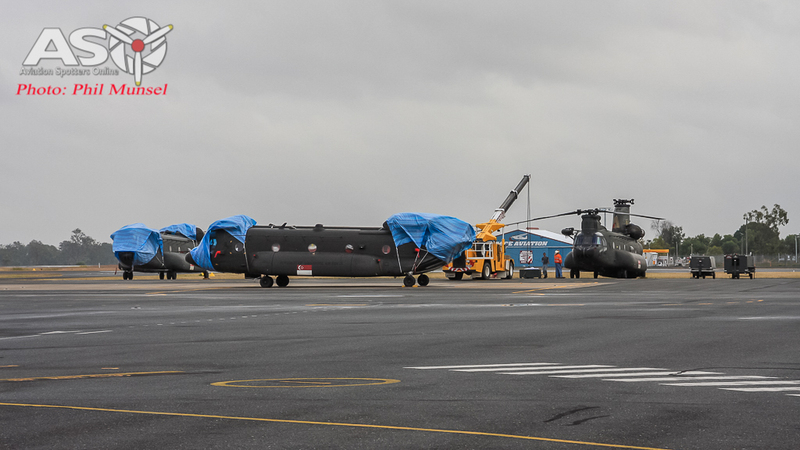 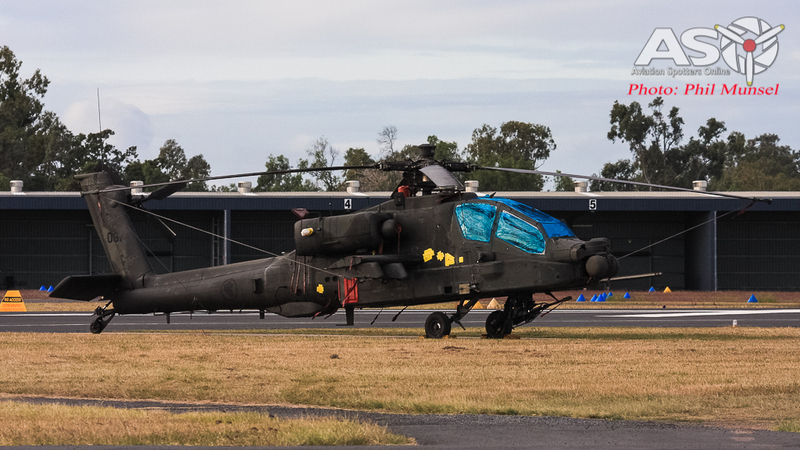 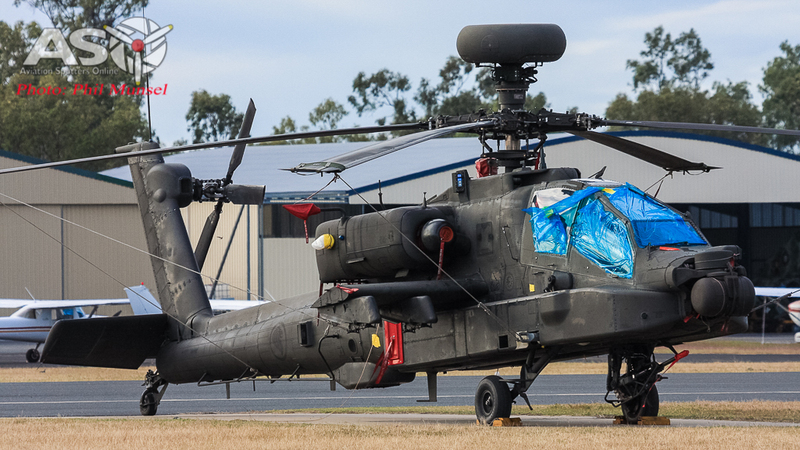 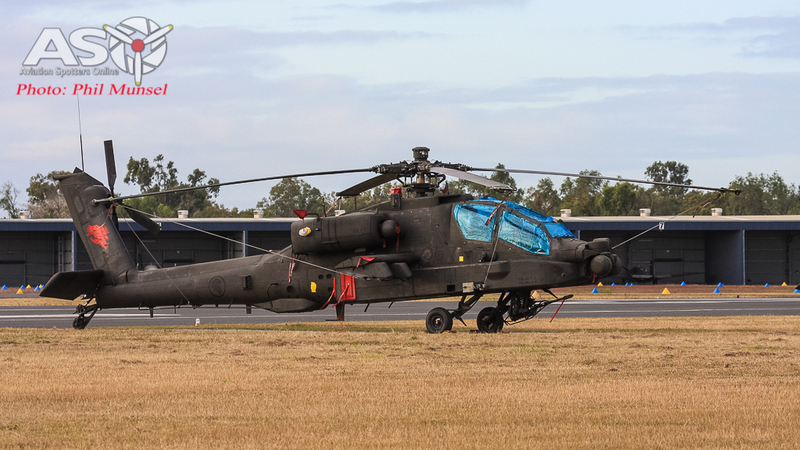 Four RSAF AH-64D Apaches await test flights. 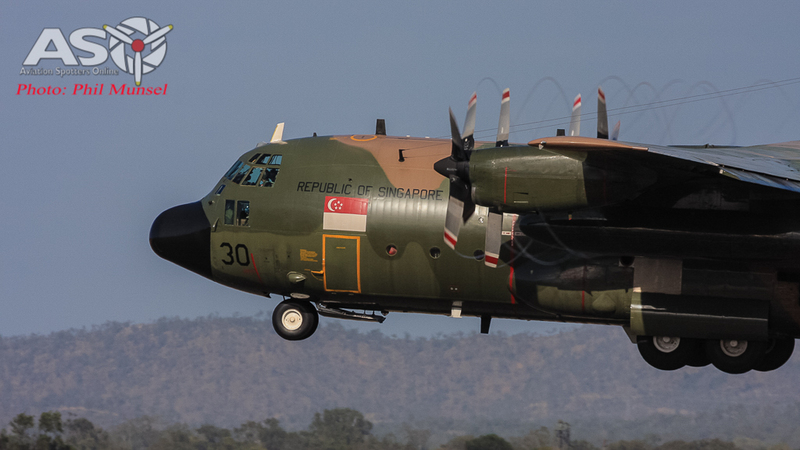 RSAF C-130H Hercules takes off while a CH-47D is being assembled. 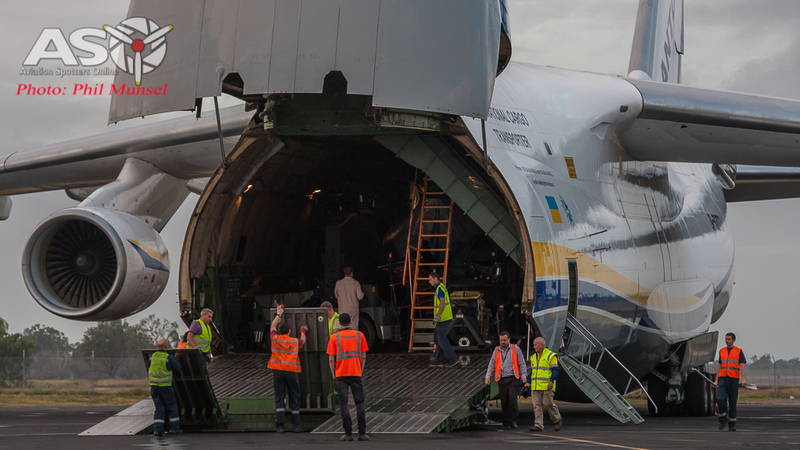 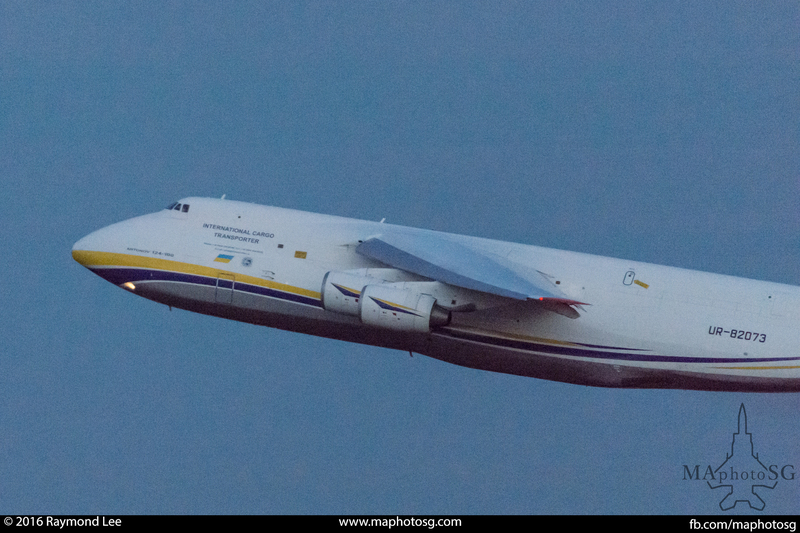 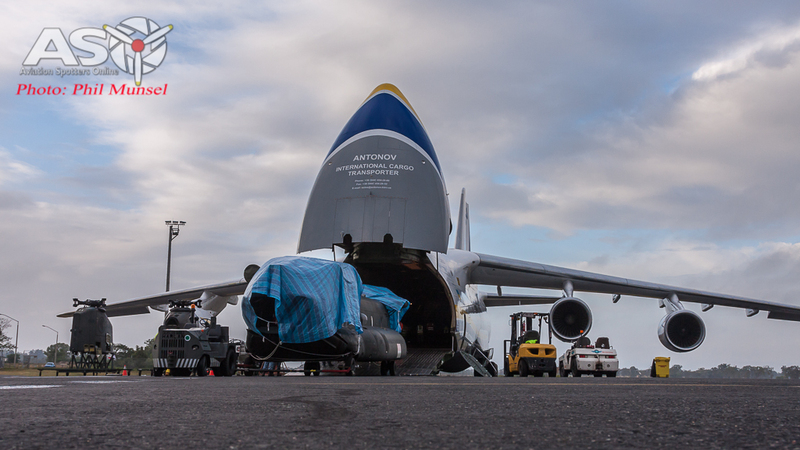 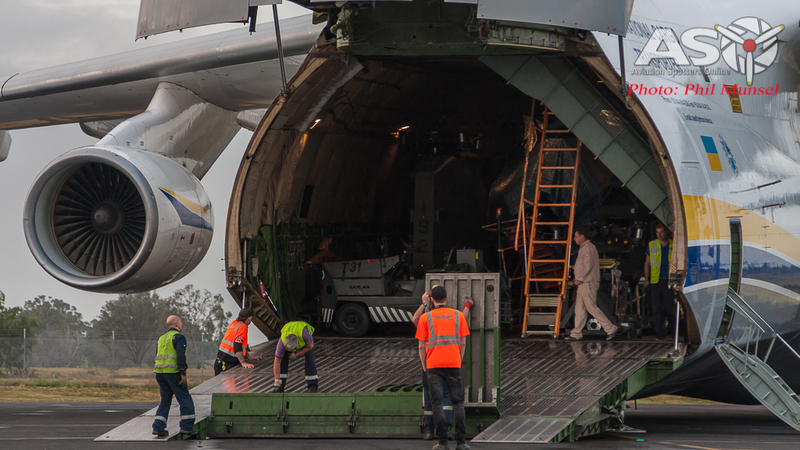 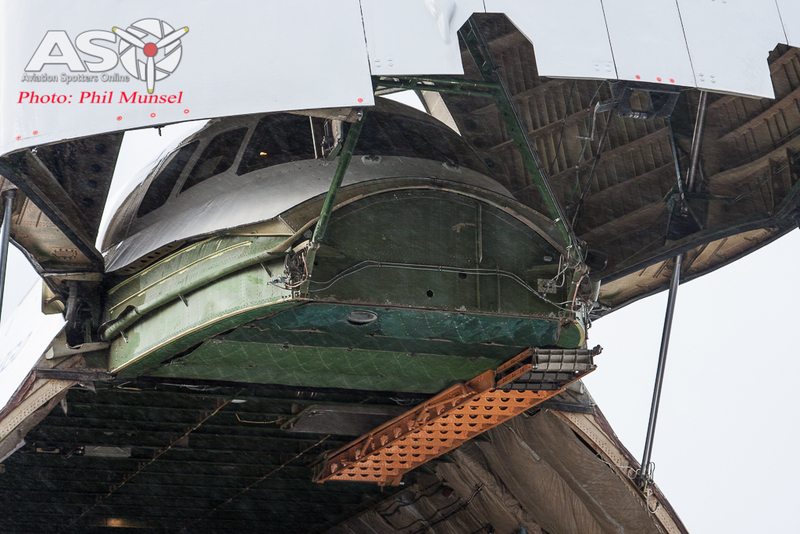 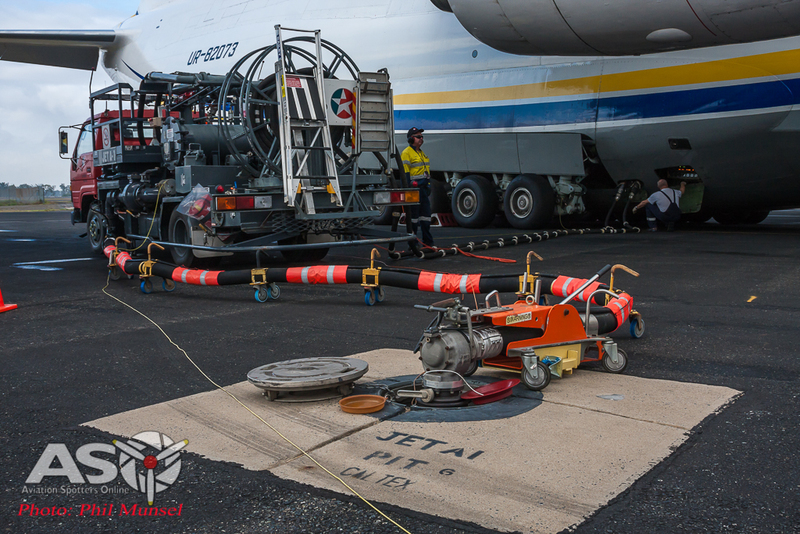 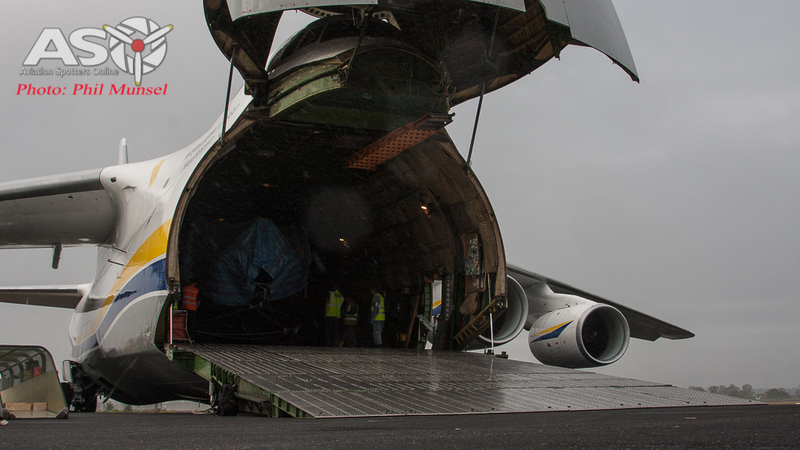 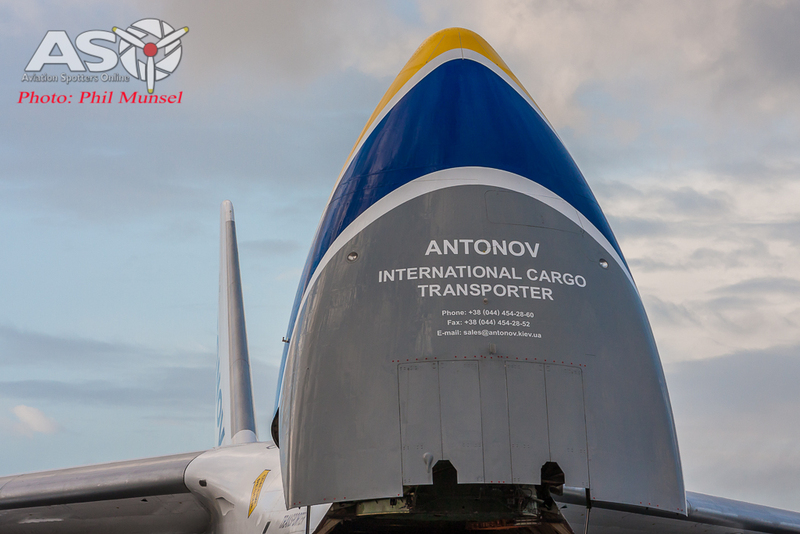 What better way to relocate equipment than that of an Antonov AN-124-100 Ruslan. 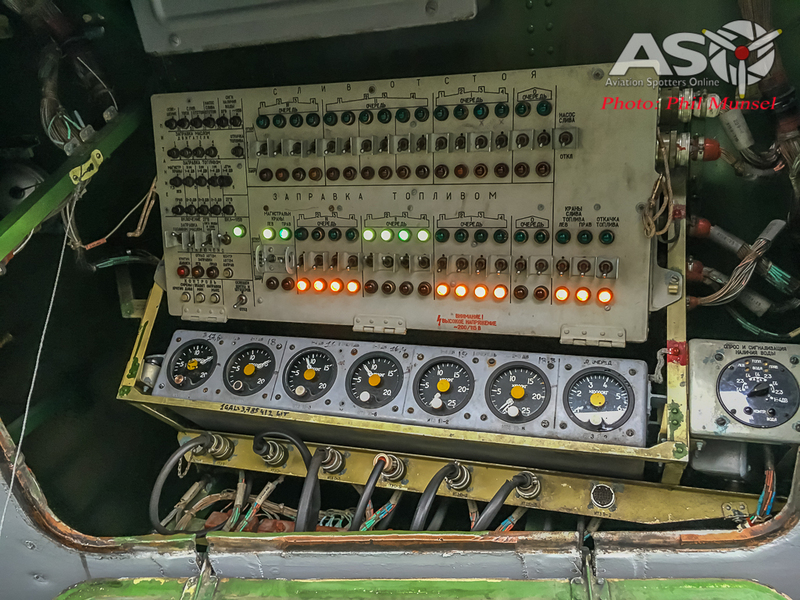 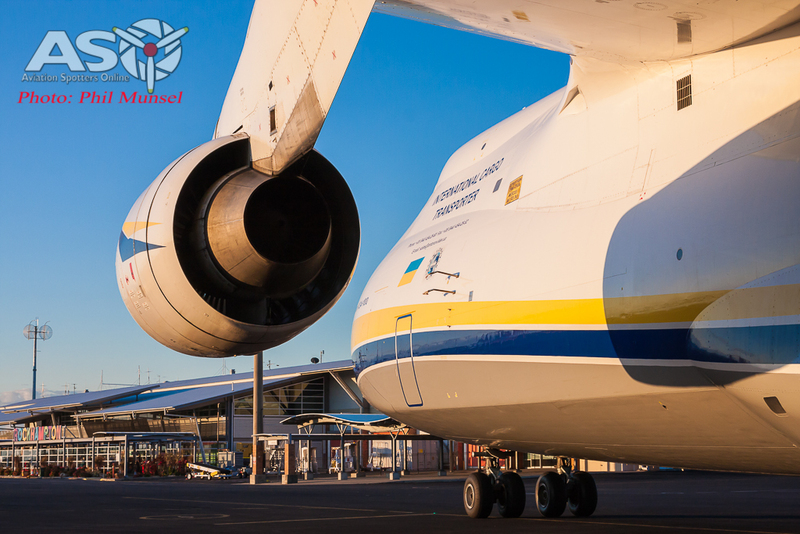 This particular airframe was built in 1994 in the Soviet Union and its primary role was for strategic military transport use, but now it’s more commonly used for charters like this with its civil certification and flown all around the world. 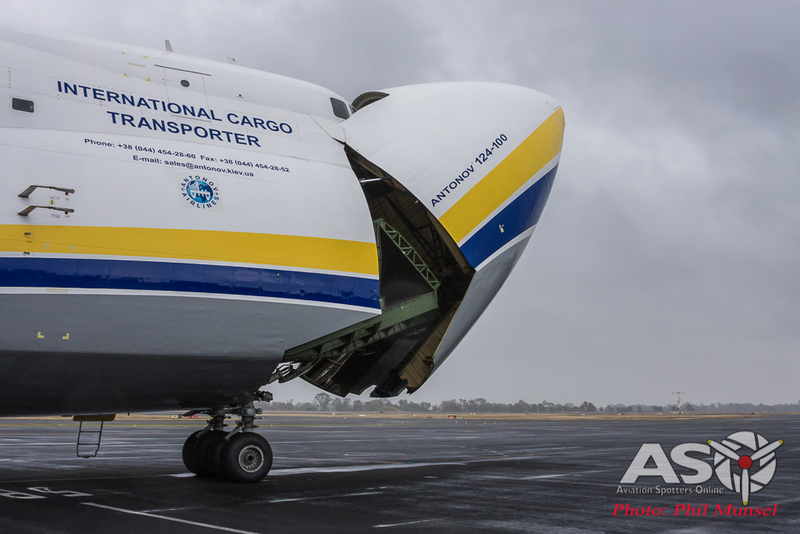 Designed with an upward hinging nose, kneeling nose wheels/folding ramp and rear split cargo door allows for rapid roll on/off cargo. 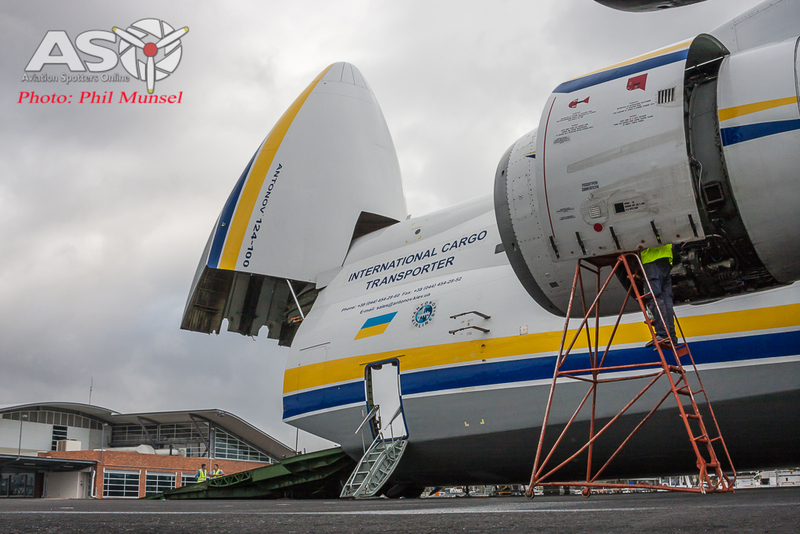 An on-board 30T overhead crane and 120T winch can aid the loading and unloading of equipment with ease. 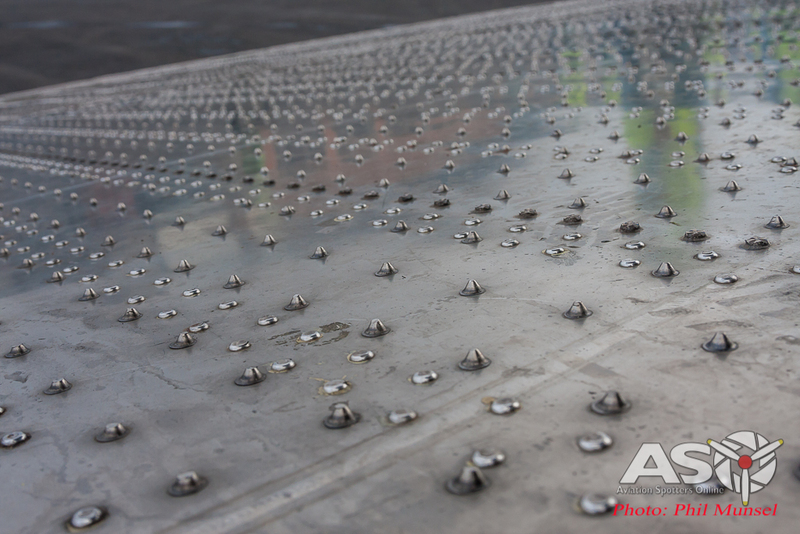 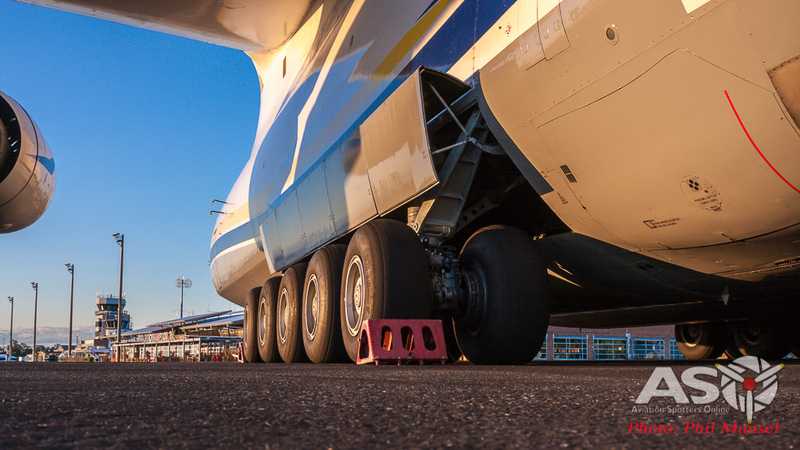 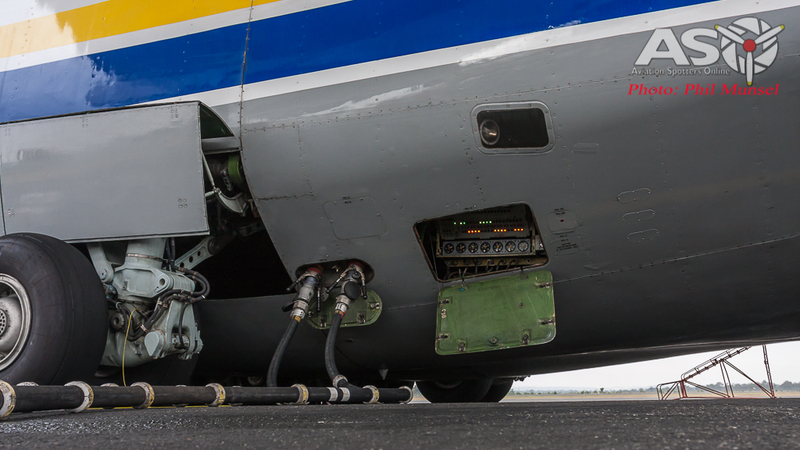 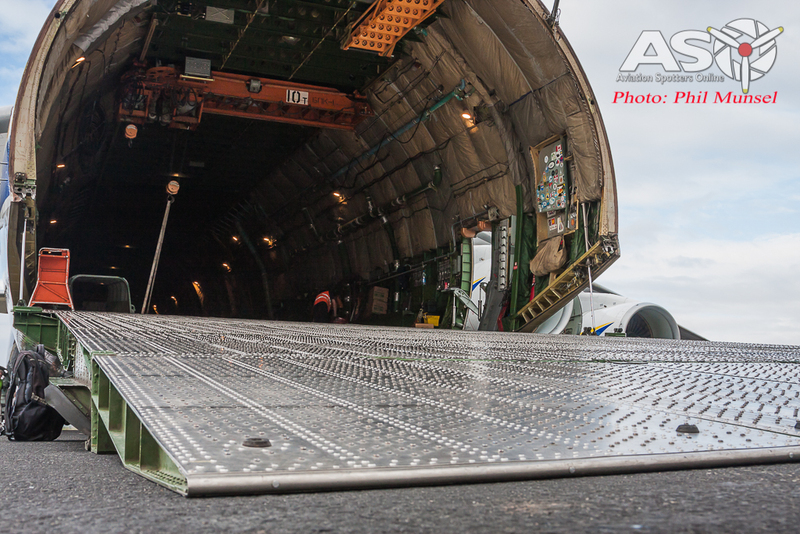 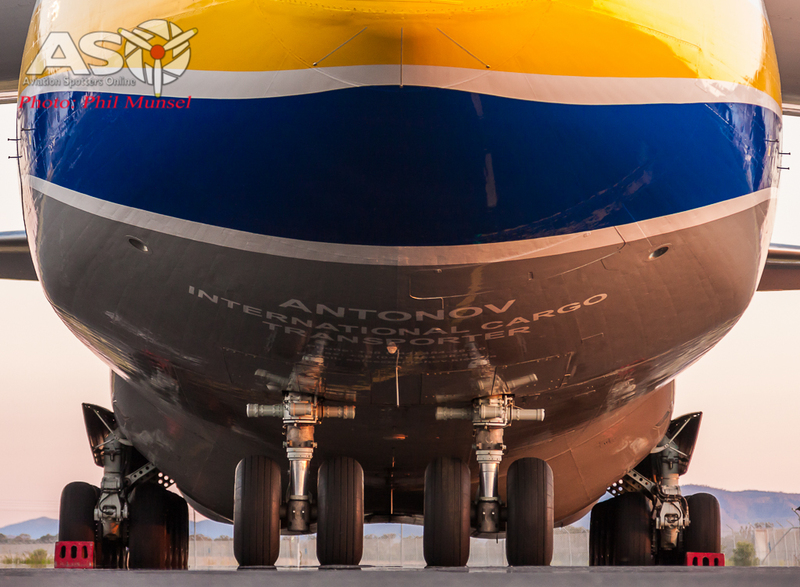 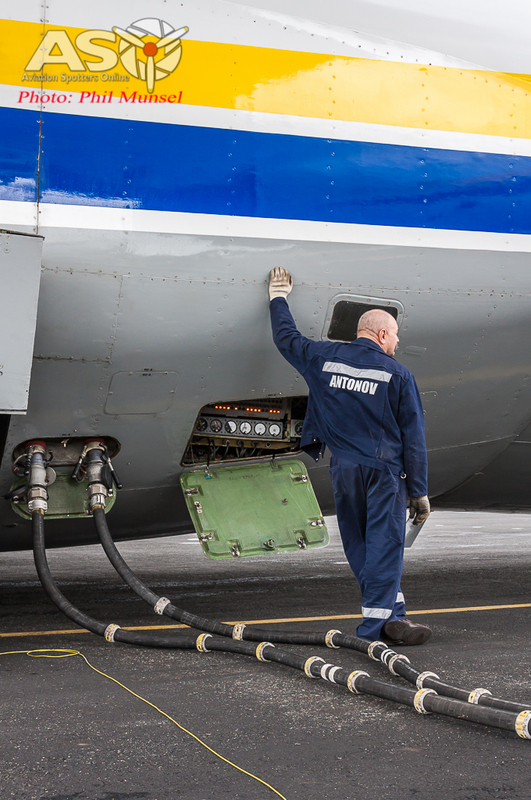 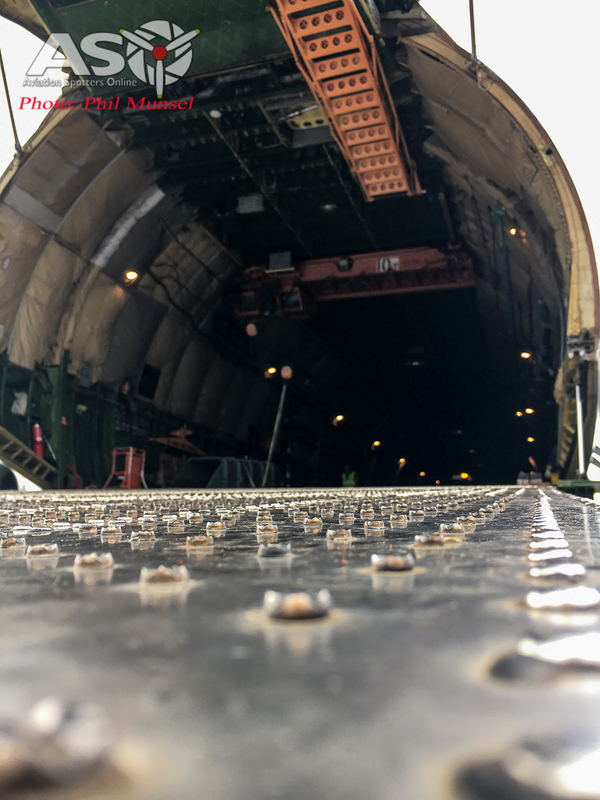 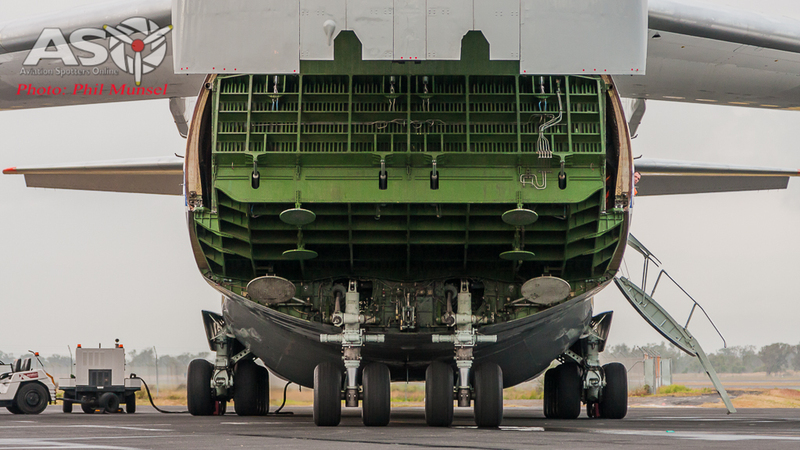 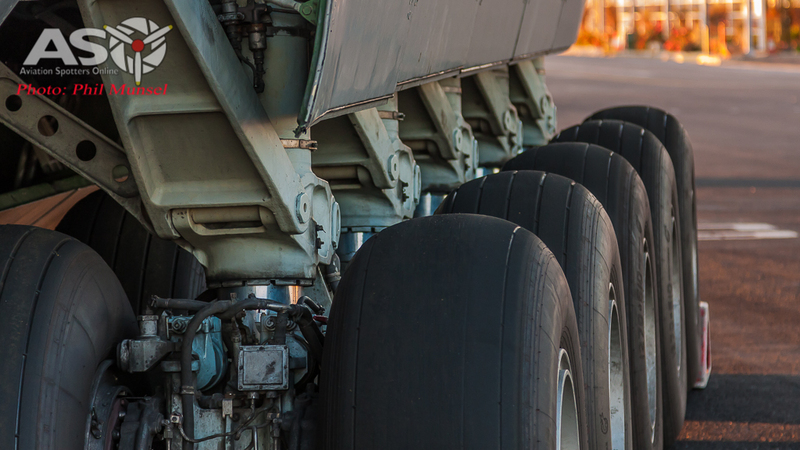 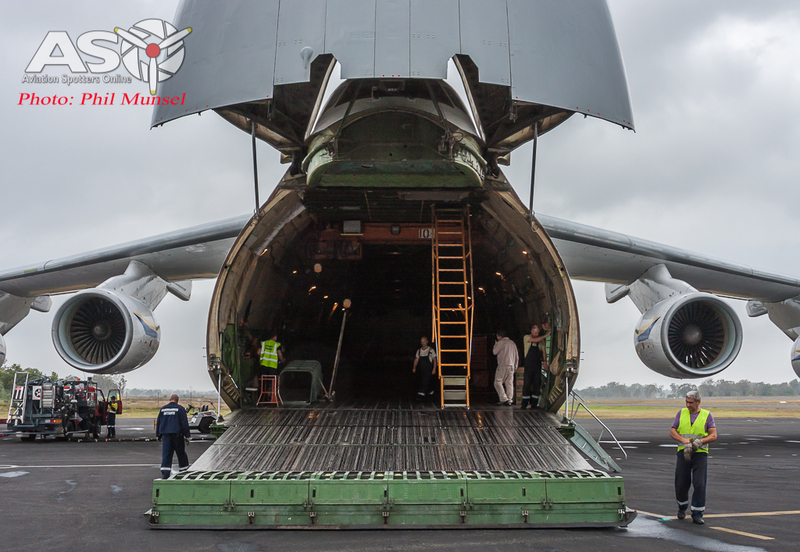 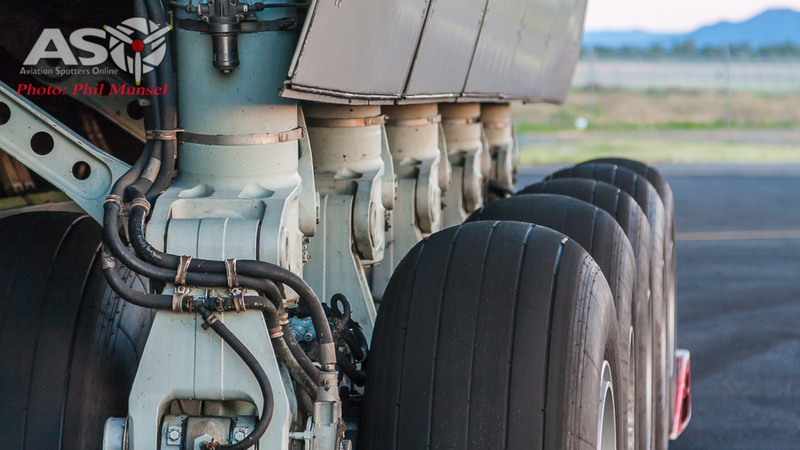 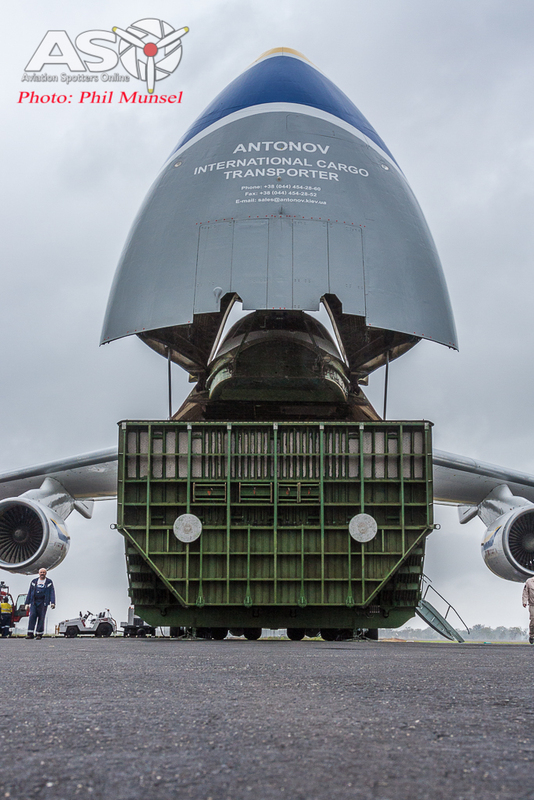 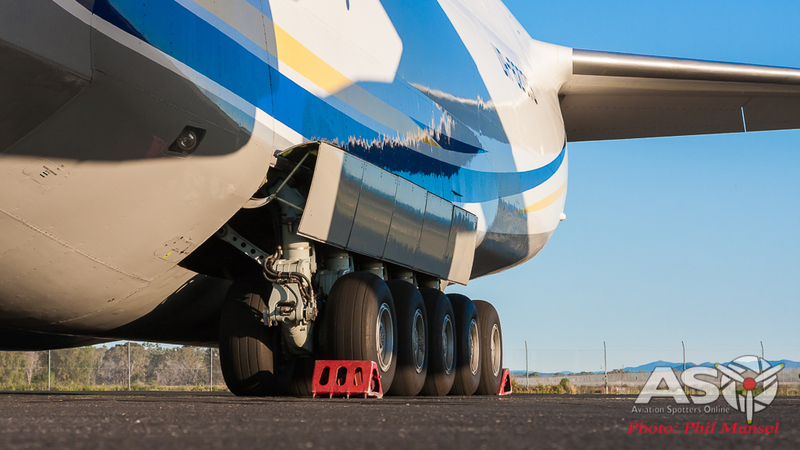 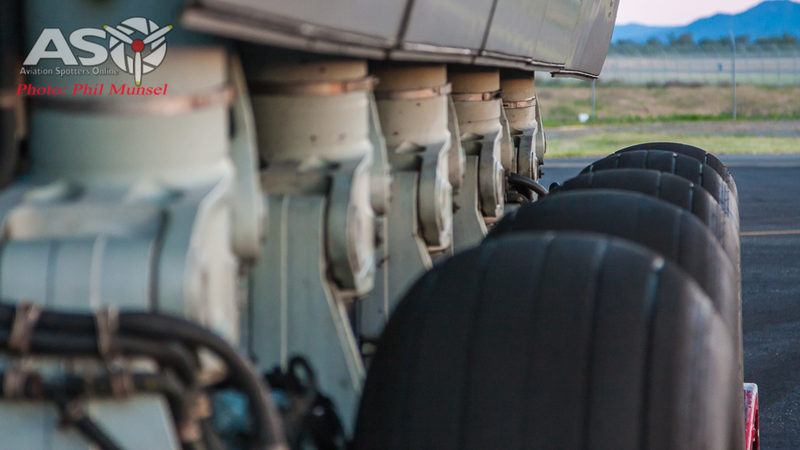 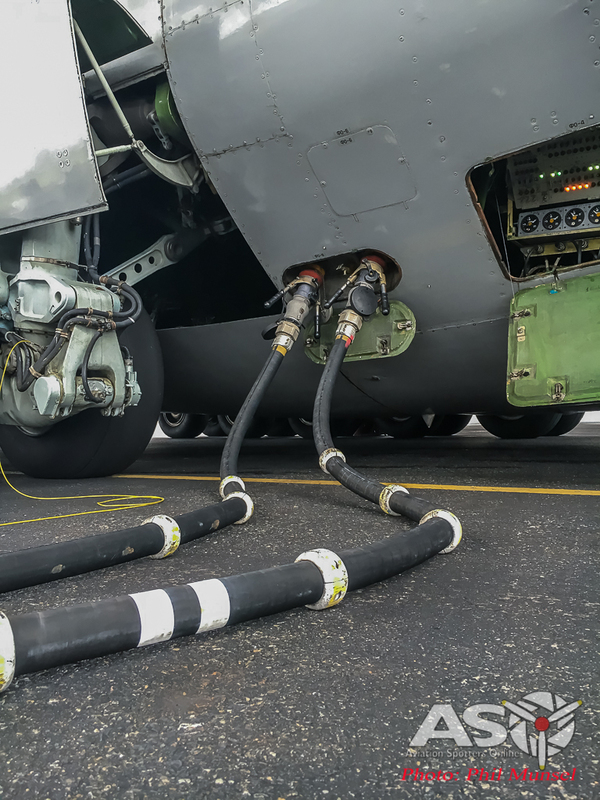 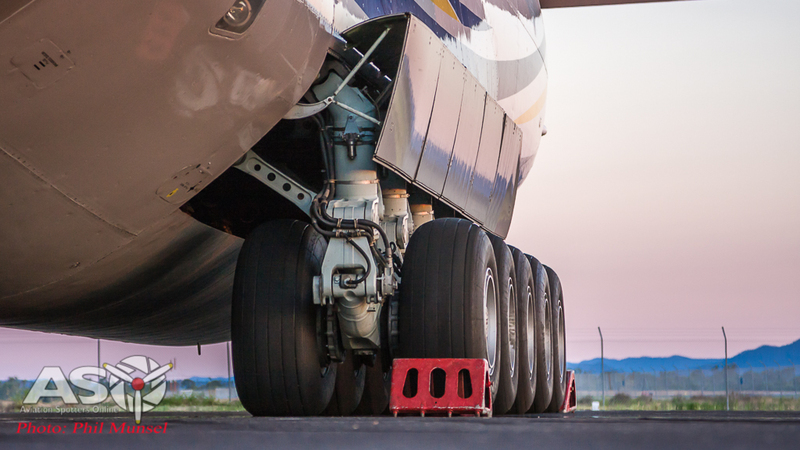 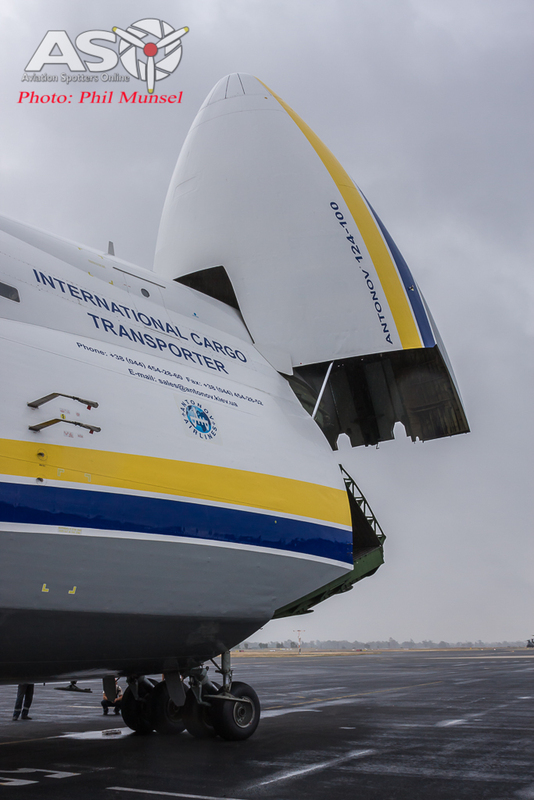 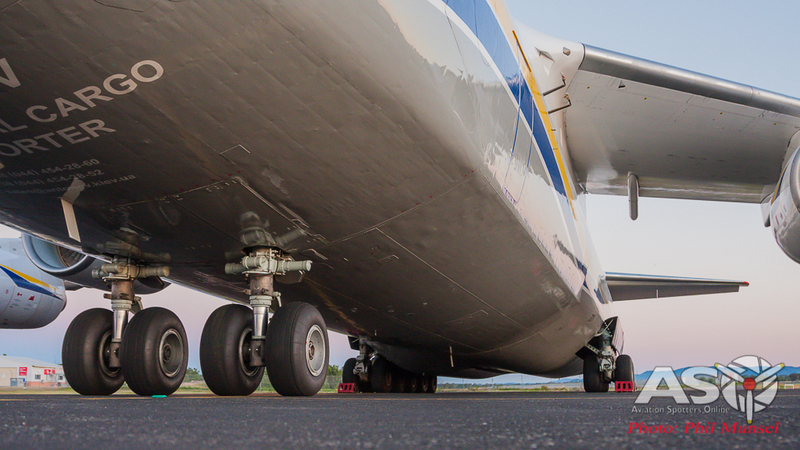 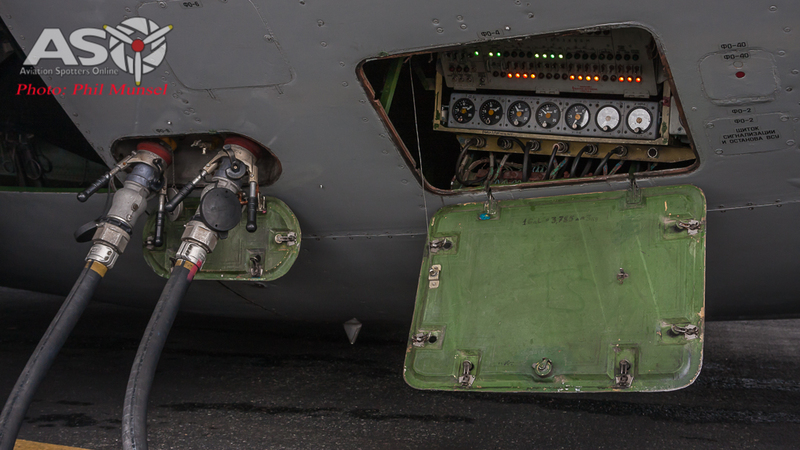 The Antonov’s undercarriage of 24 wheels and oleo struts has been designed to cope with operating from unprepared fields capable of handling rough ground/snow covered and even ice formed terrain. 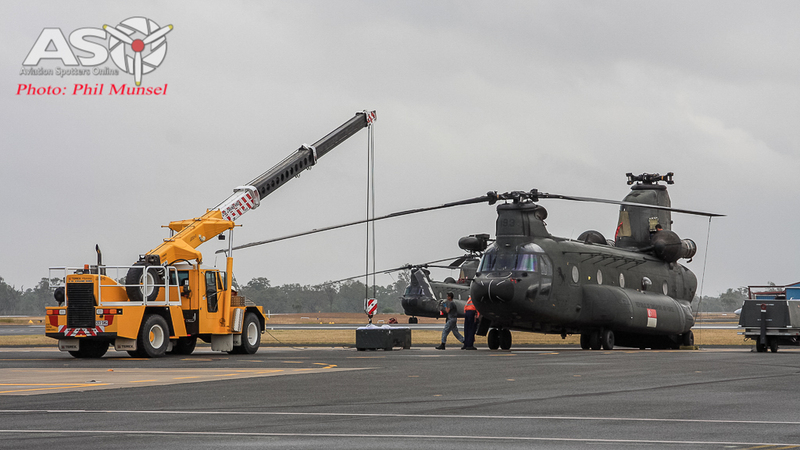 Plenty of room to swing a cat! 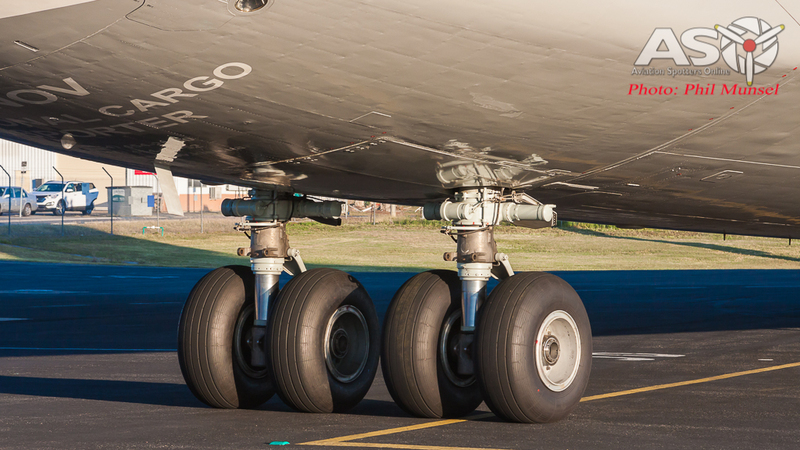 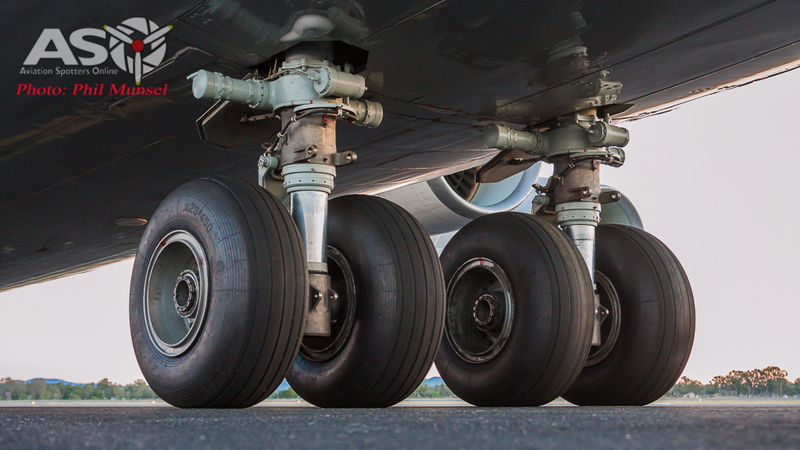 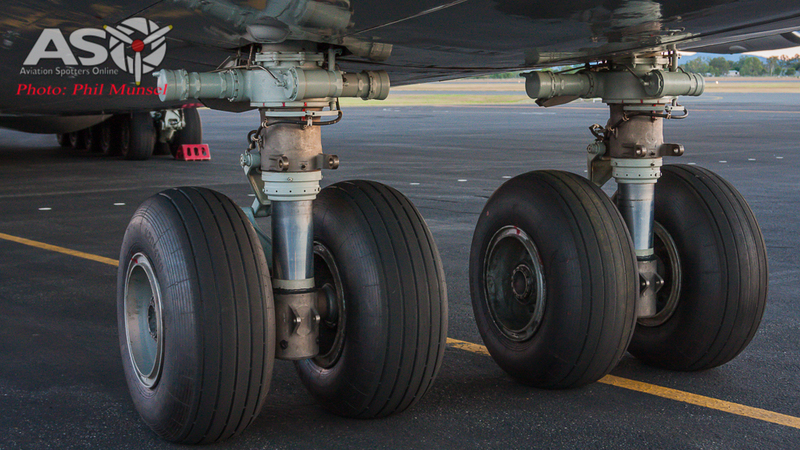 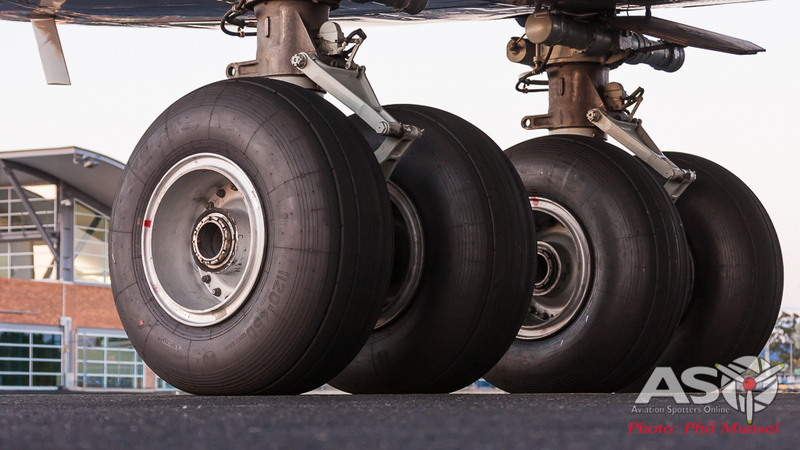 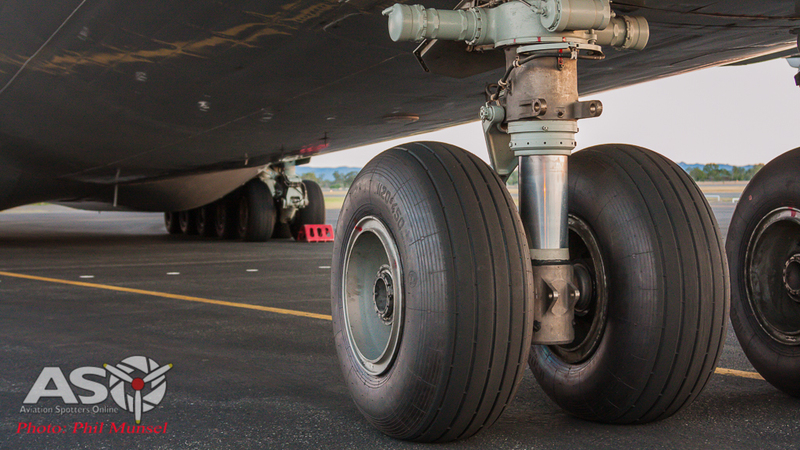 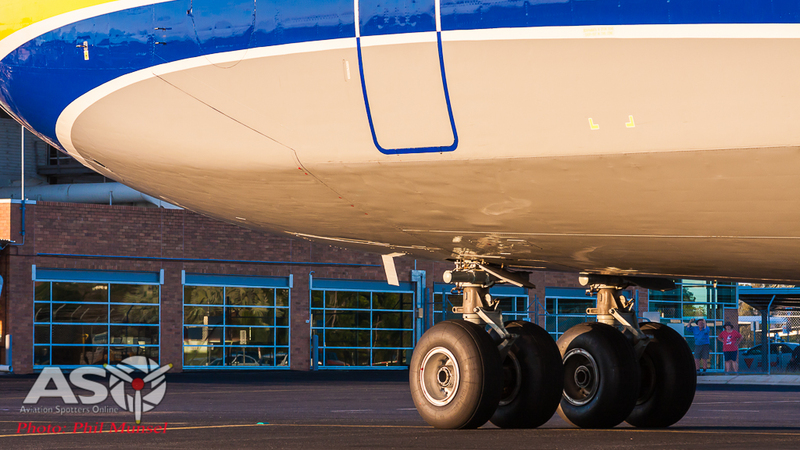 The very robust main undercarriage! 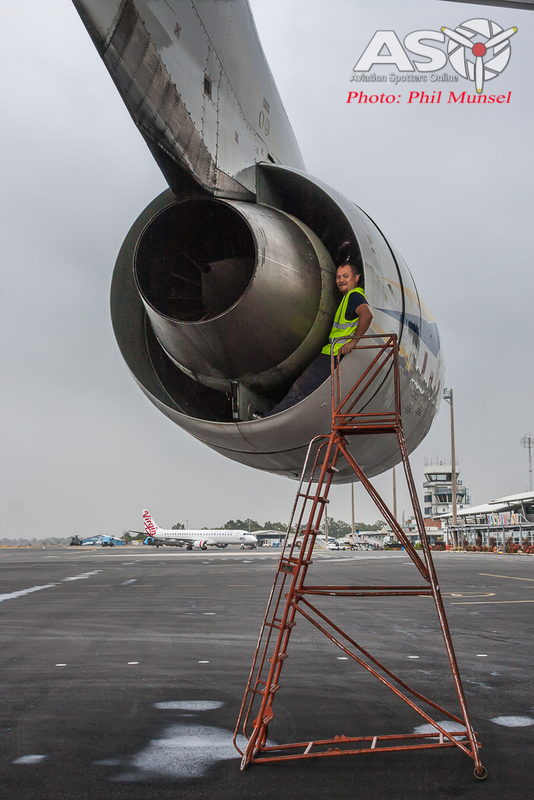 No time for rest as the ground staff help the crew unload the cargo! 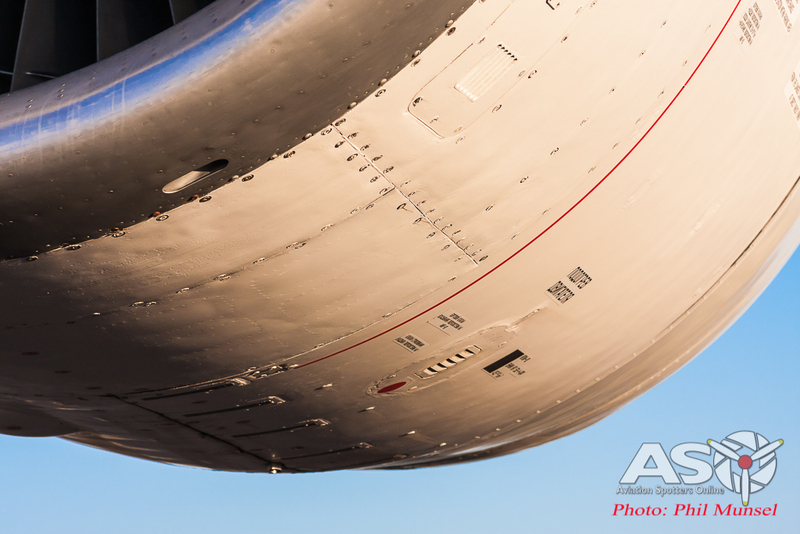 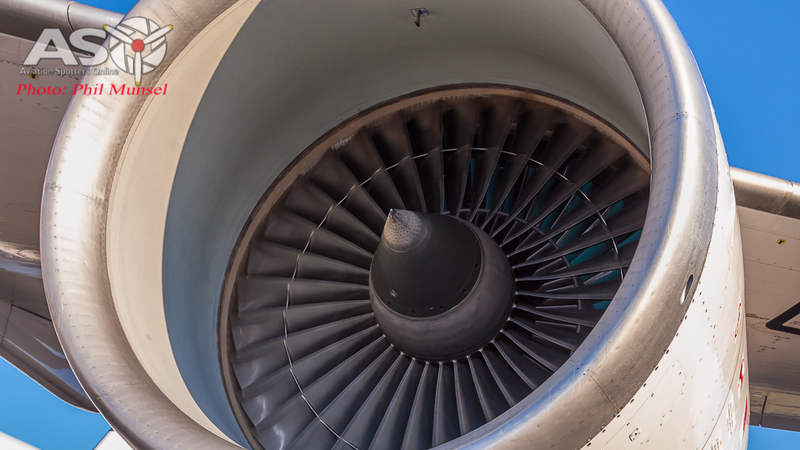 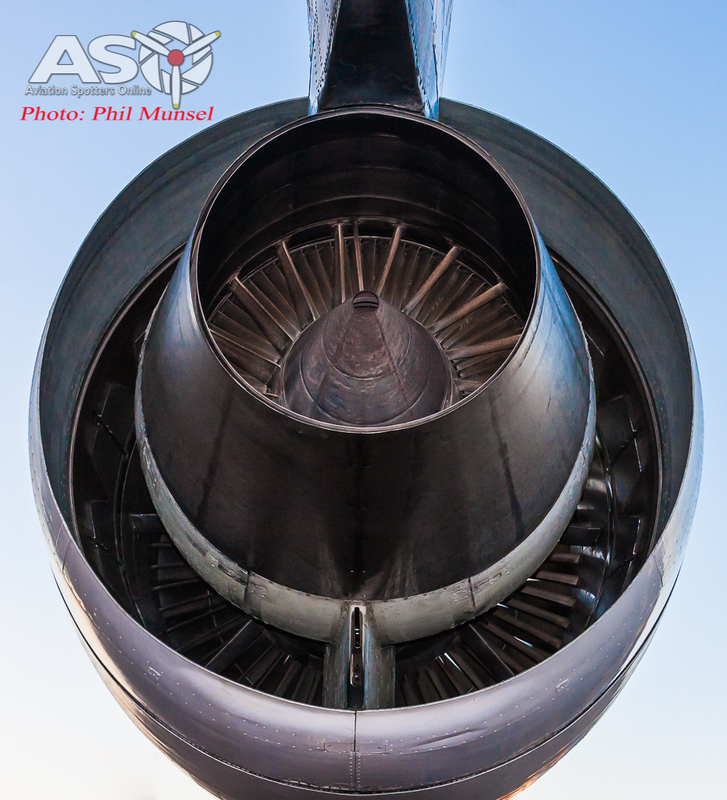 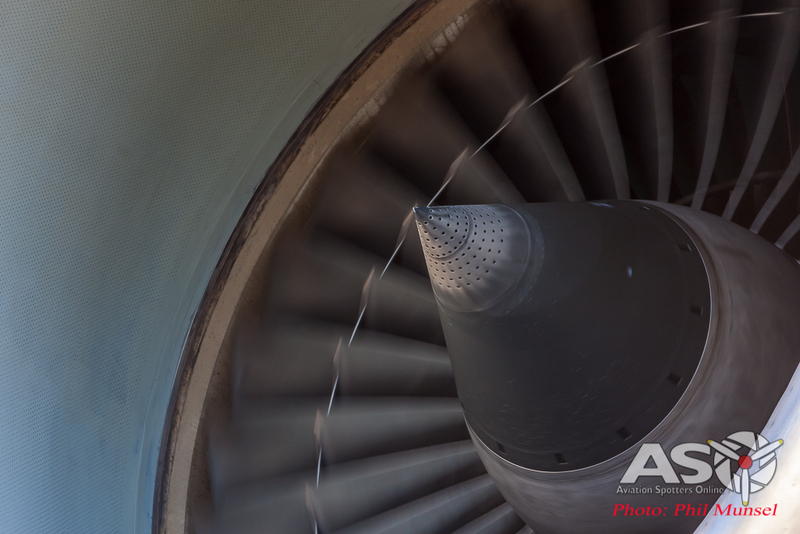 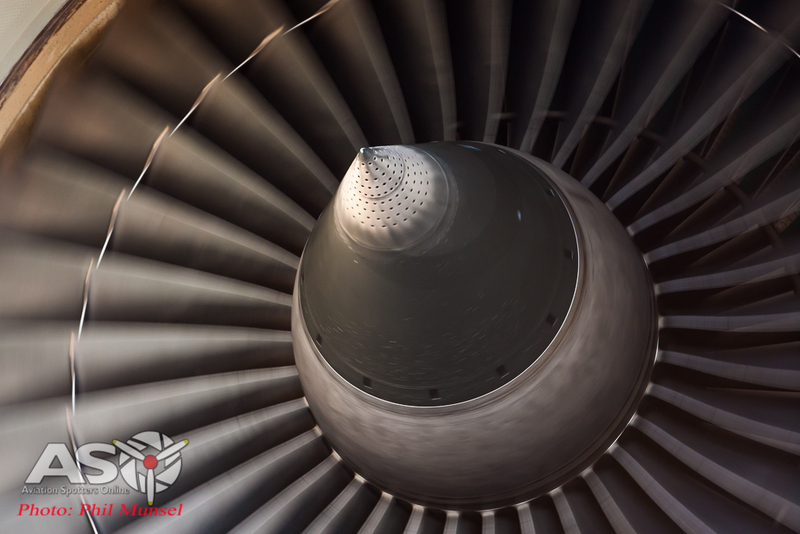 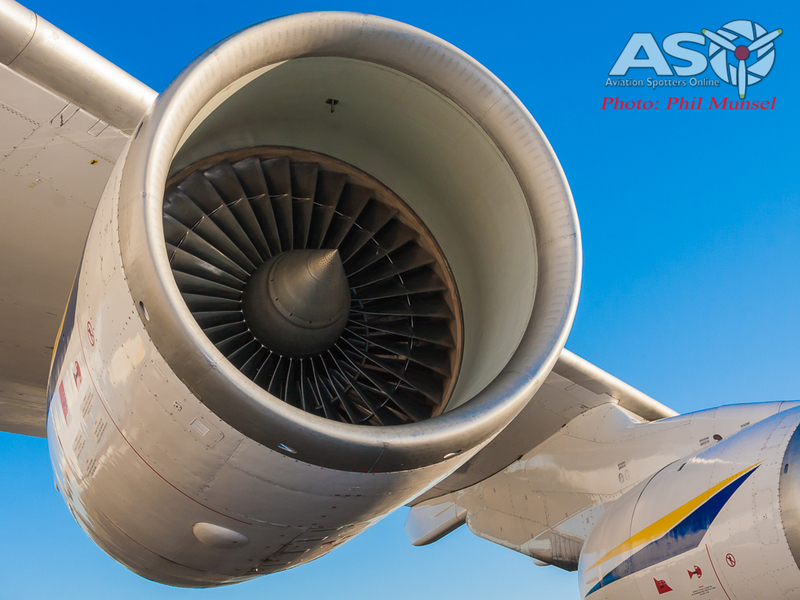 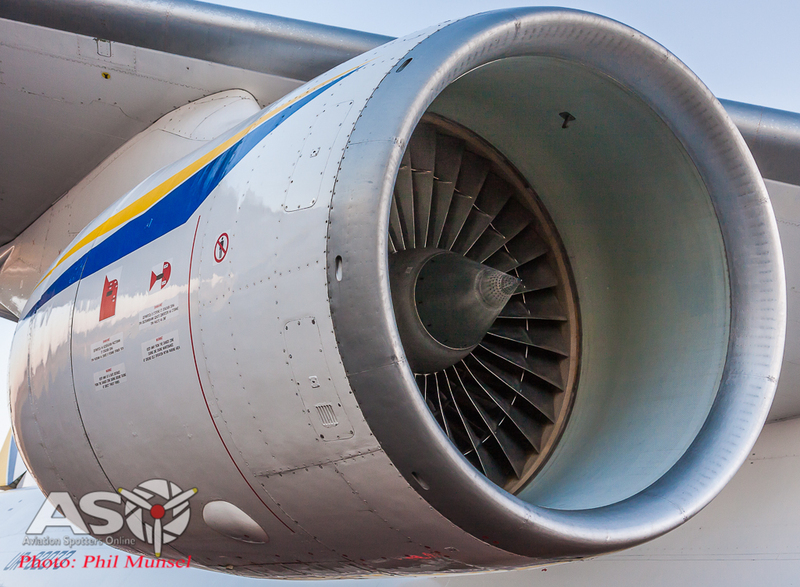 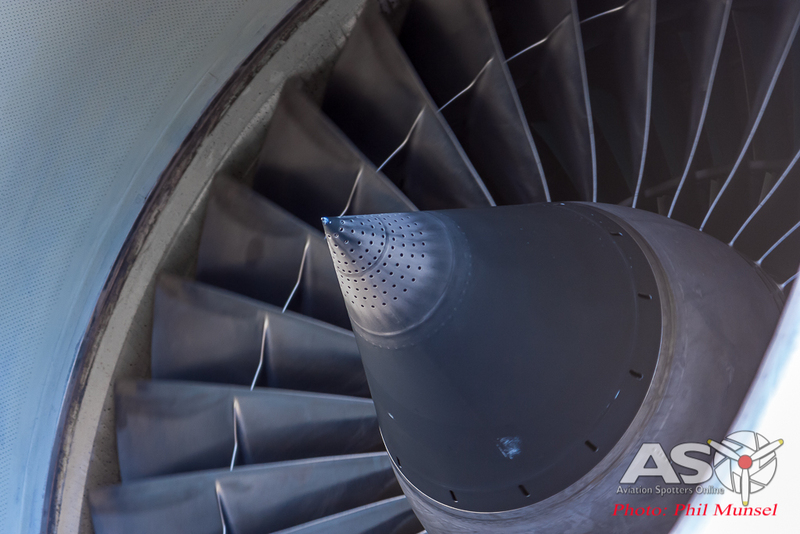 One of the four large Progress D-18T Turbofans! 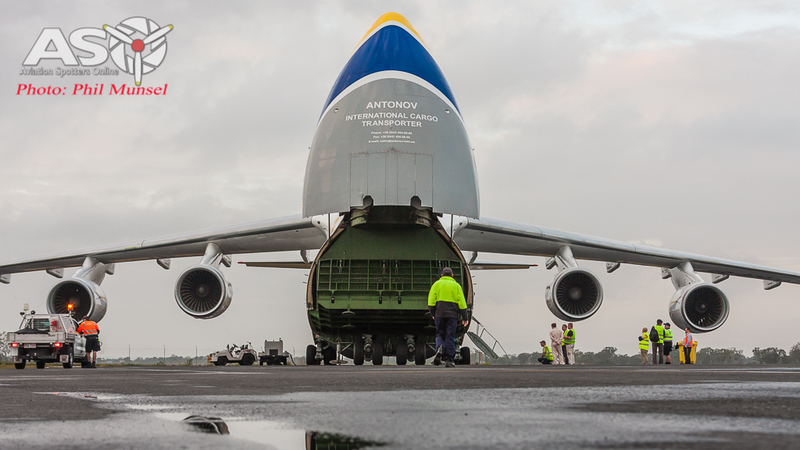 Payload for this Russki beast can be up to 150 tonnes and a maximum take-off weight of 405 tonnes! 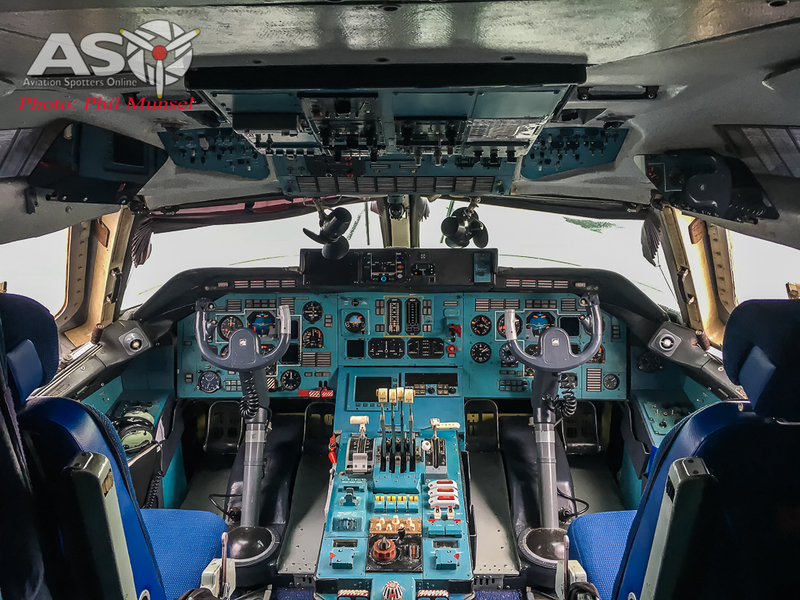 Crew of 6 having – Pilot, Co-Pilot, Navigator, SNR Flight Engineer, Flight Engineer and Radio Man. 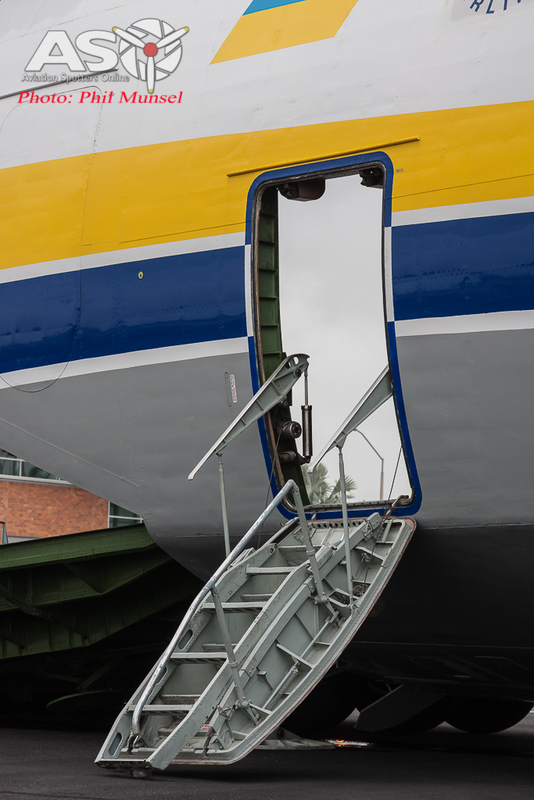 88 passengers can be accommodated on the upper deck behind the main centre wing box section. 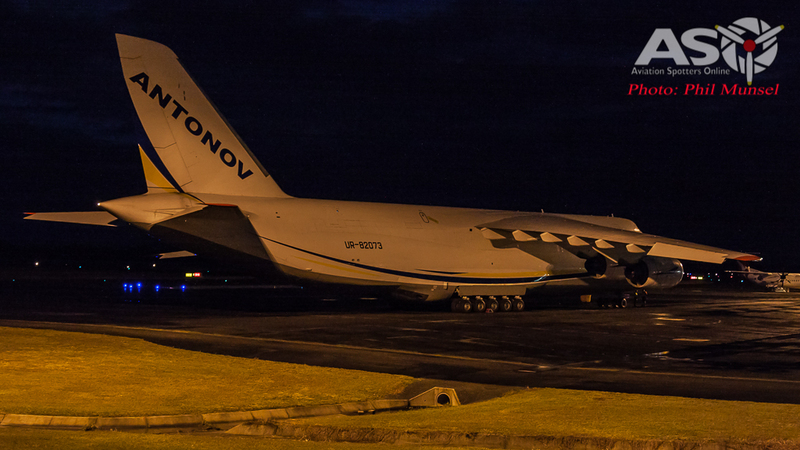 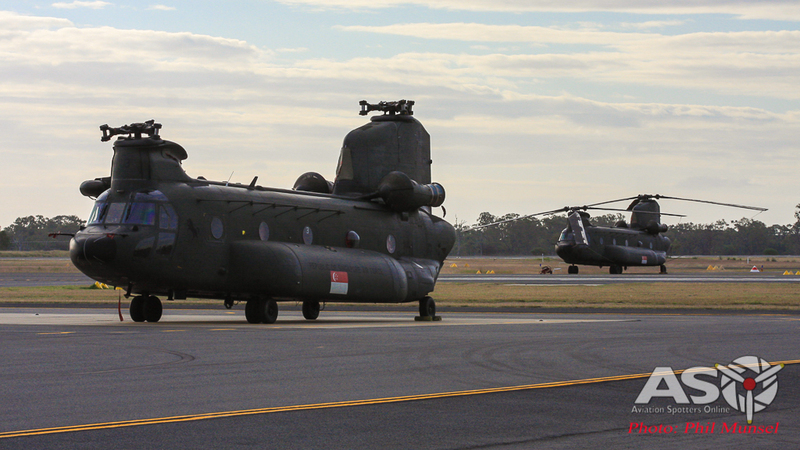 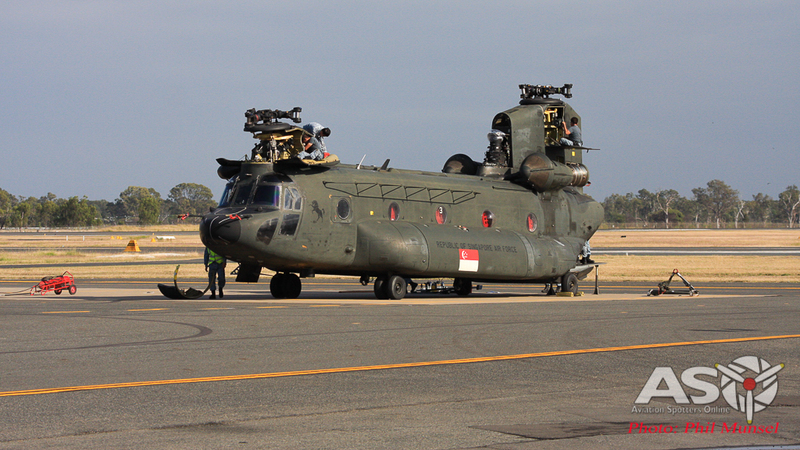 One of the early morning arrivals into Rockhampton Airport. 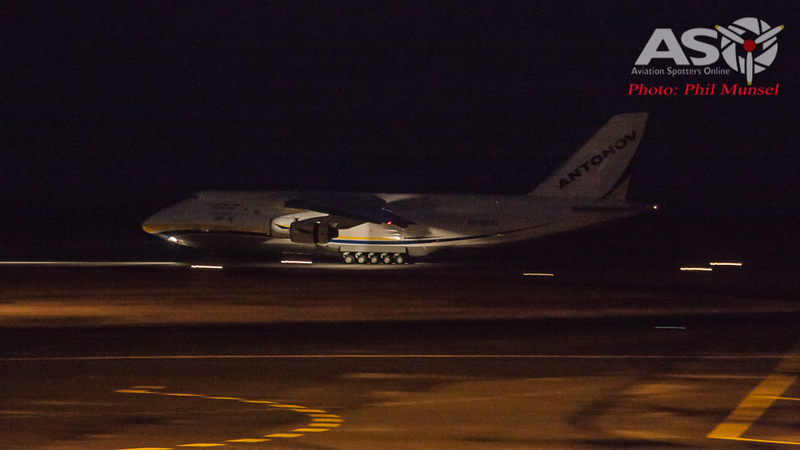 This year’s scheduled times has shown it to arrive in the early hours of 4:30am in the morning and actual arrival time was not far off that. 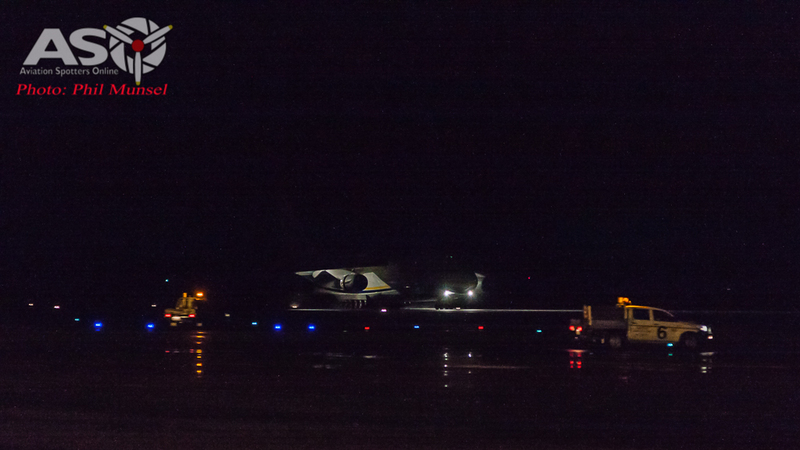 As photography is a growing hobby of mine, I wanted to push my comfort zone a little and try to see if I could get some night shots on arrival, which I have never done before due to thinking it’s almost impossible! 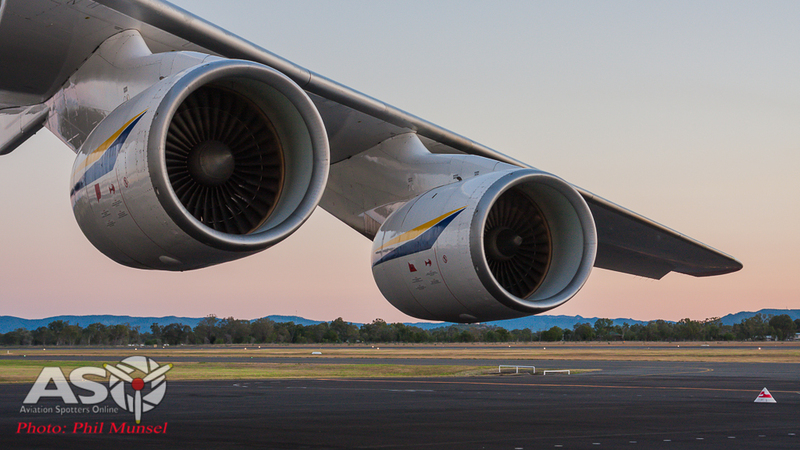 After seeing other photographer’s pictures that similar photos can be done, I thought I should dive into the deep end and give it a crack…what have I got to lose! 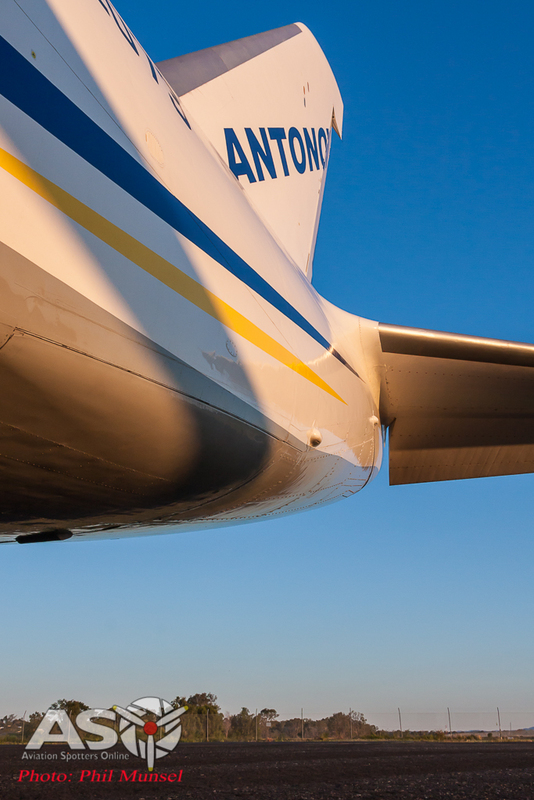 I don’t get to practice with my camera as much as I’d like to, so I’m still learning functions that ‘I should know’ to help progress my skills. 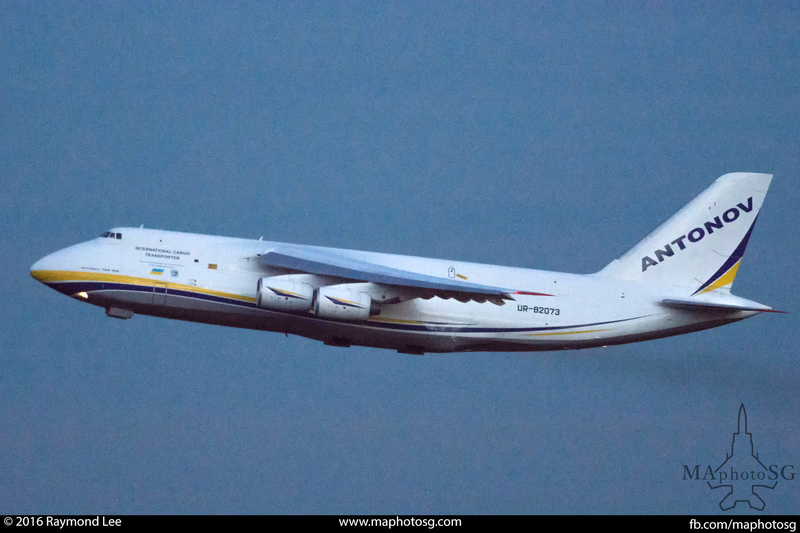 To me I feel comfortable with choosing the shutter speed (Shutter Priority Mode -Tv), as manual settings is still unfamiliar territory for me, so I hope I can step up with my panning ability at low light! 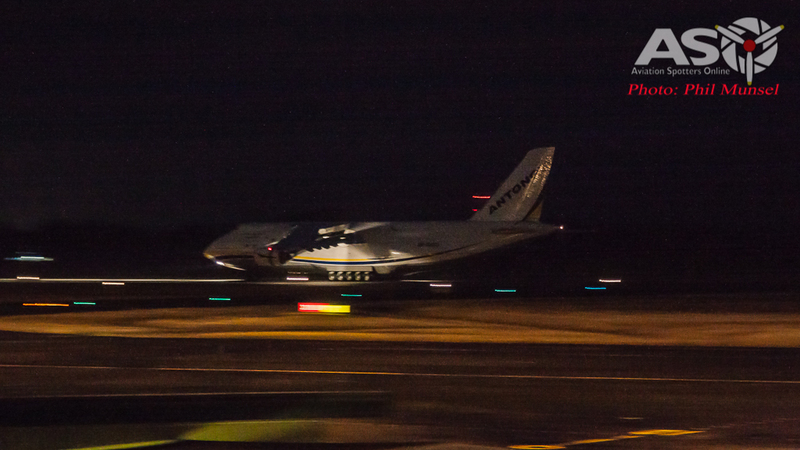 Anticipation is climbing as I see the Ruslan on finals, I’m surprised at how smoothly and quietly it touches down, as I take some shots I relise that my burst shutter speed is slower than thought, as its night and it takes longer to write more information to the card, so careful not to overdo it, as I’ll have to wait longer before I can continue shooting. 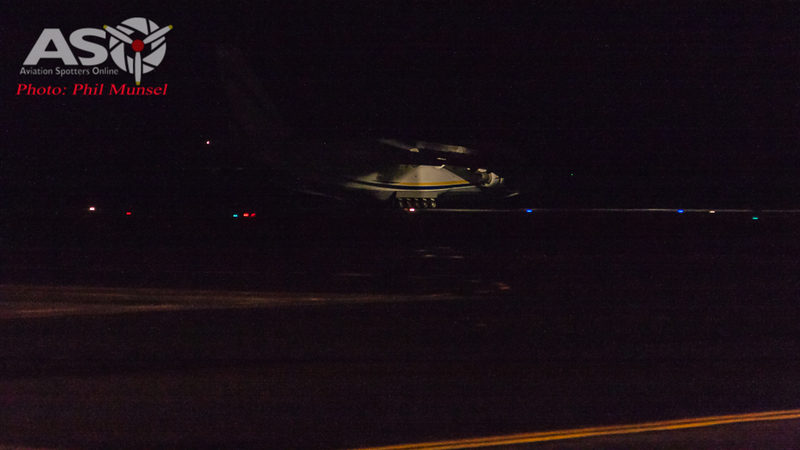 It’s hard to see on my camera screen how the shots turned out. 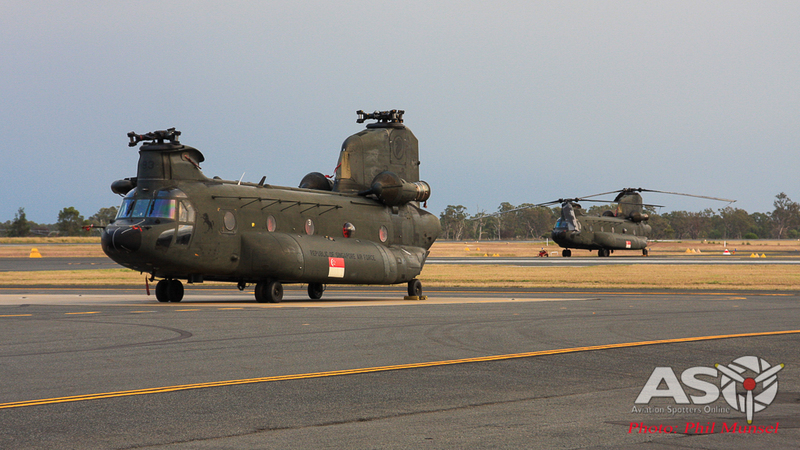 At home I view them and I’m a little disappointed, I’m hoping that I can salvage some in Light Room. 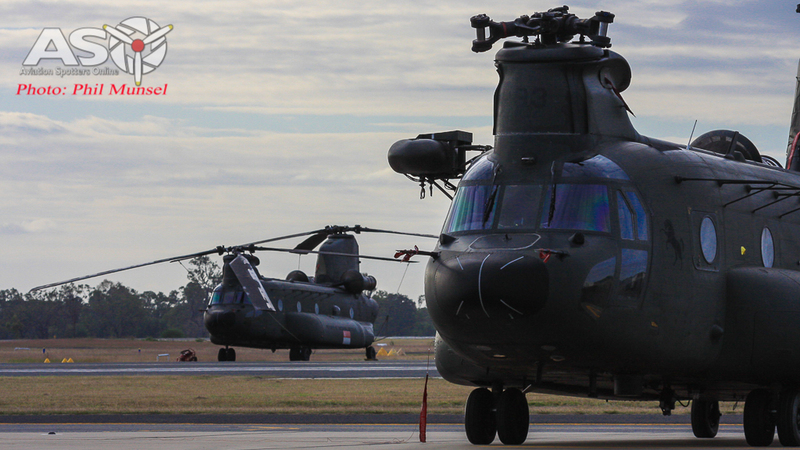 I have managed to edit a couple but compression looses more detail. 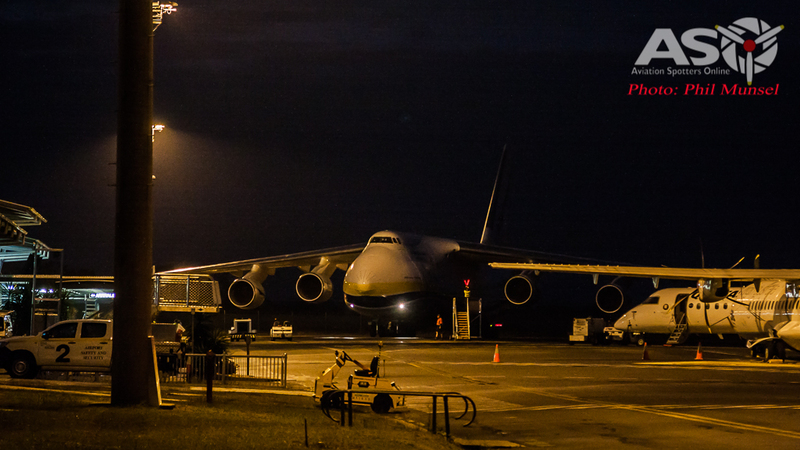 I managed to get some shots that may give you the idea what it was like that early morning of the arrival. 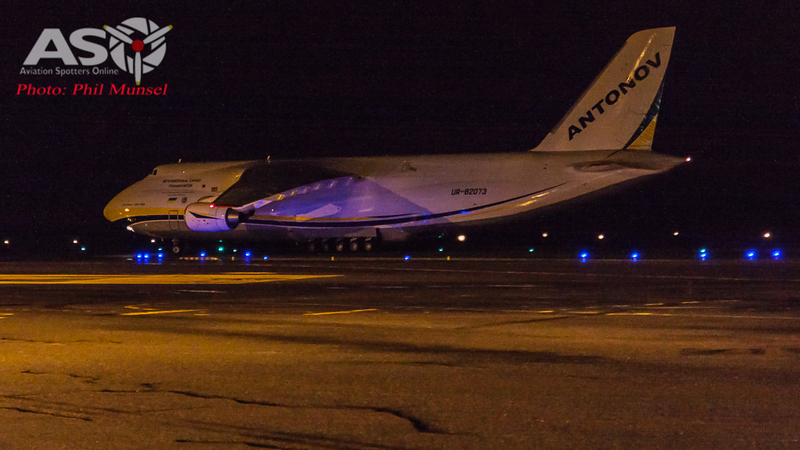 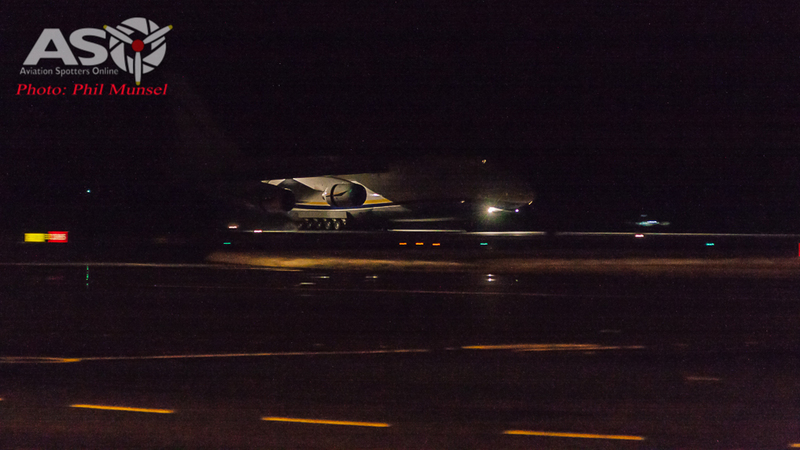 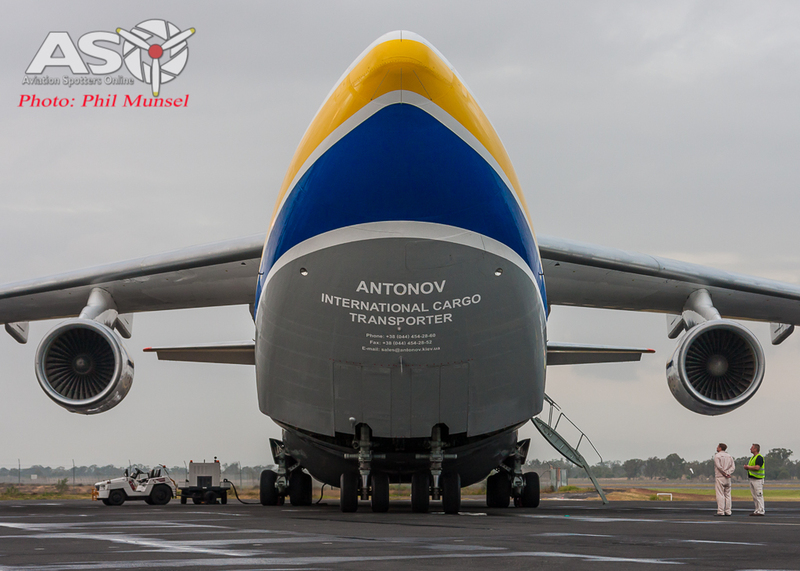 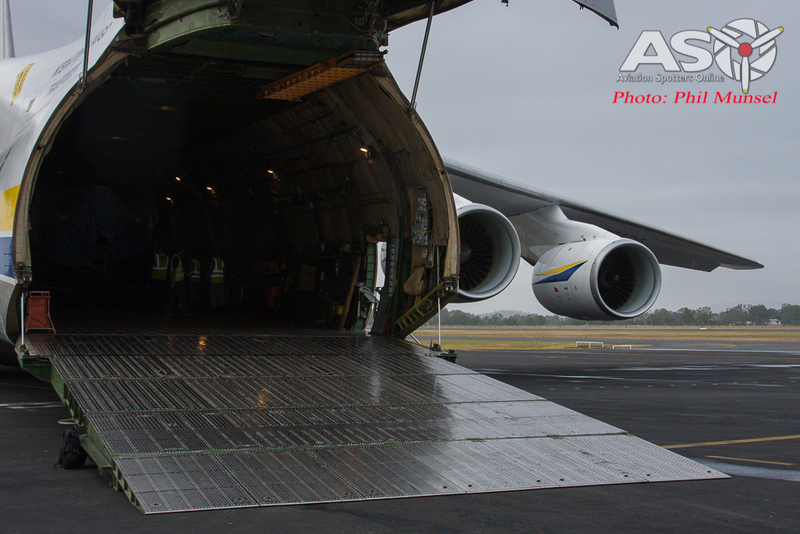 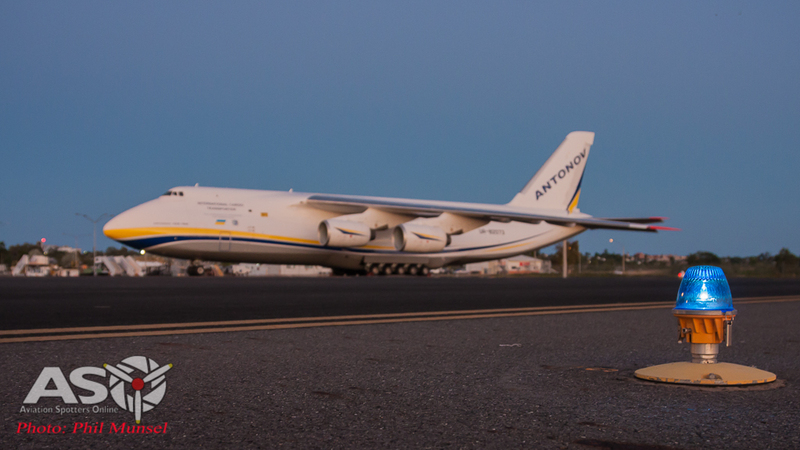 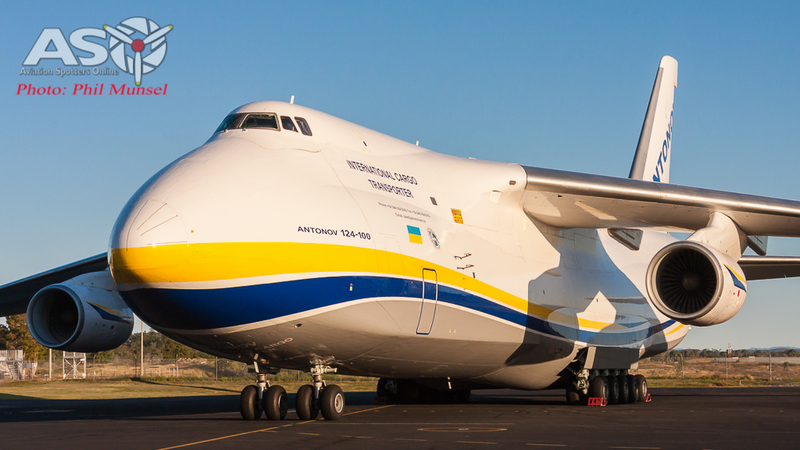 The large Antonov carefully taxiing to its bay for the unloading. 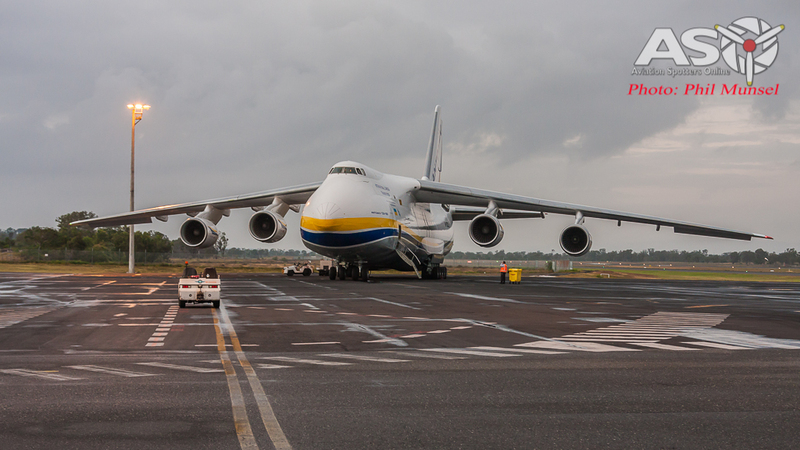 The size of this Beast is amazing! 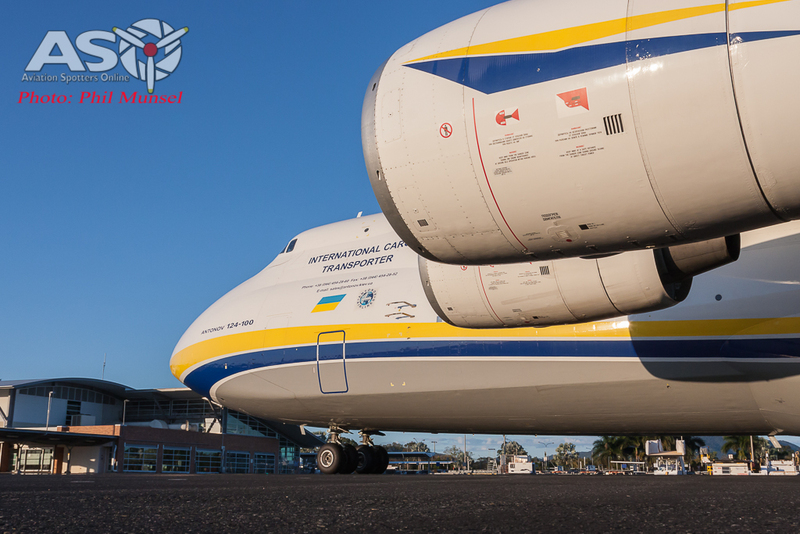 My next meeting with this unique flying machine is to get some close up shots in the afternoon sun with a walkaround photo journal before it departs later that night. 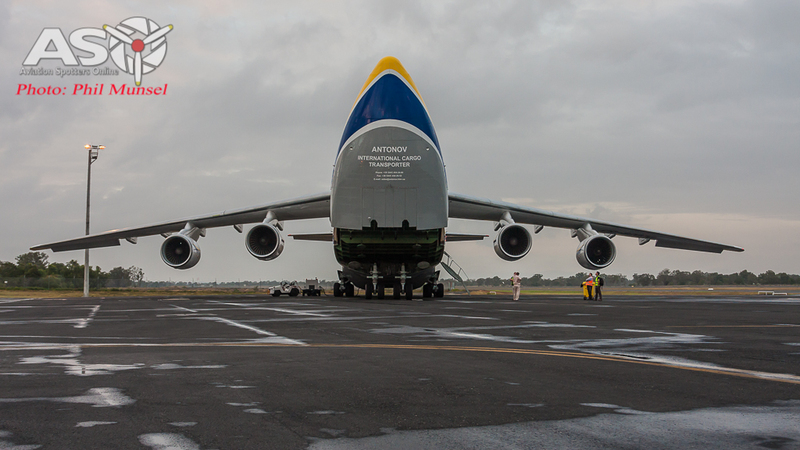 The Large 20+ metre tail! 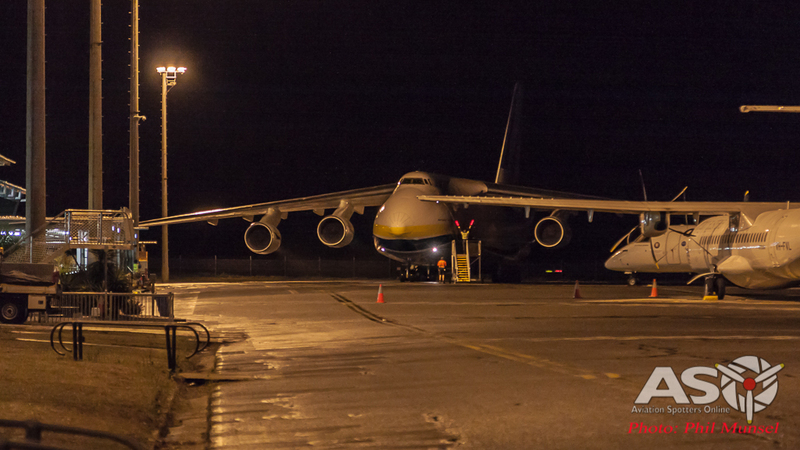 It was great not to be in a rush so I could take my time moving around looking for possibilities. 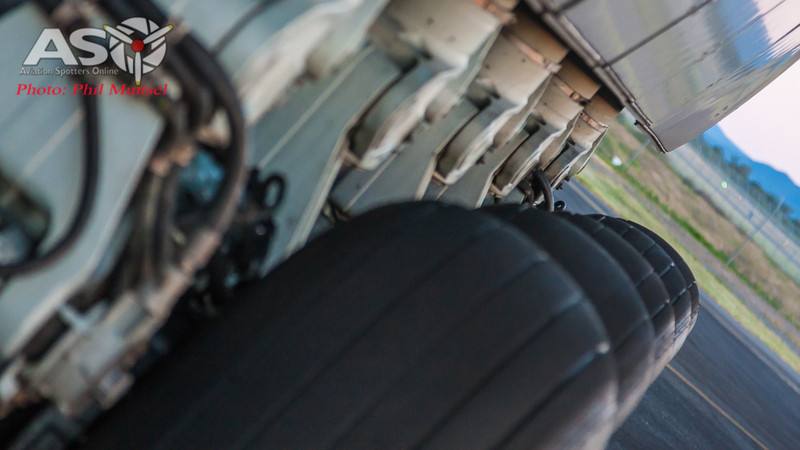 If I feel I’m rushed I tend to get flustered and can’t think straight. 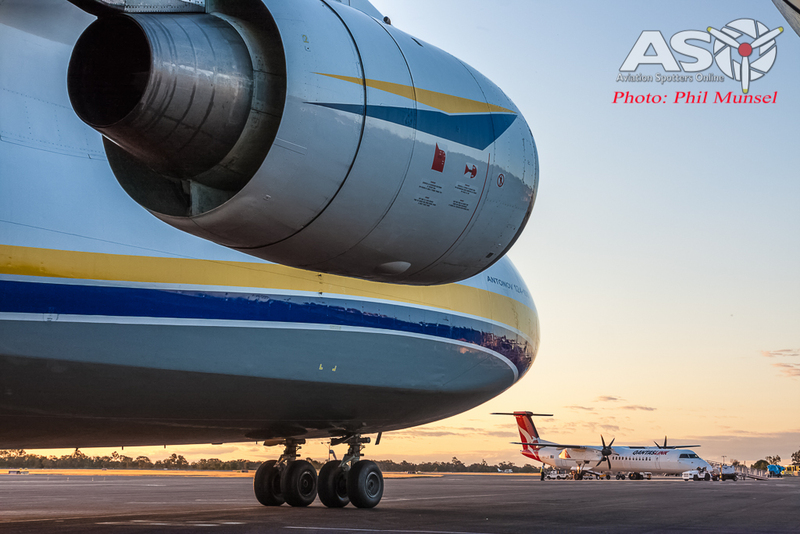 Taking photos is something I like to do, so it’s a bit of ‘Me’ time to take it all in and enjoy the moment! 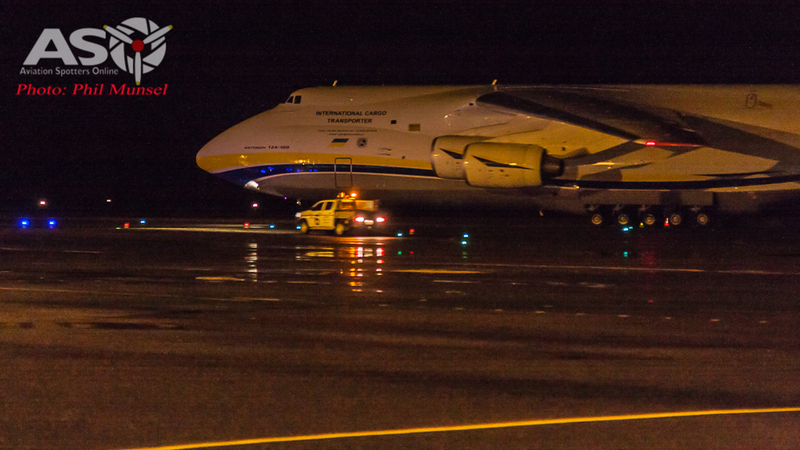 Patiently awaiting crew for another long haul flight! 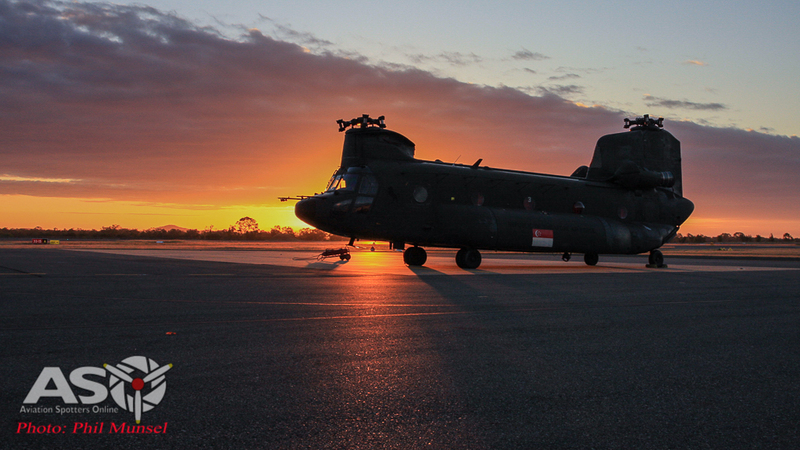 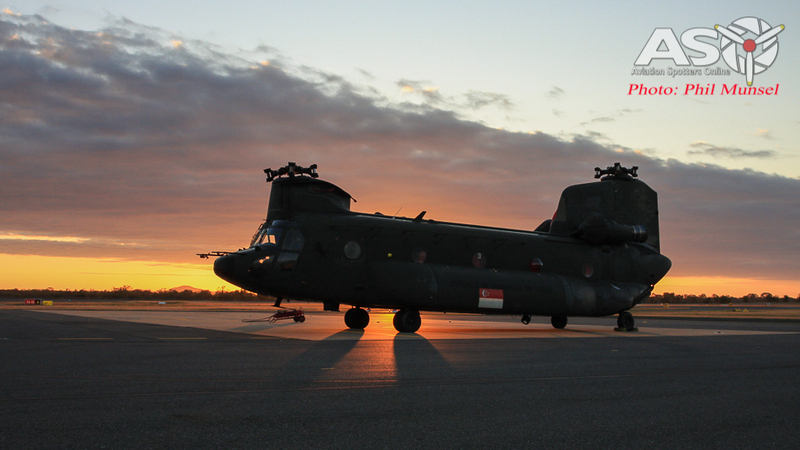 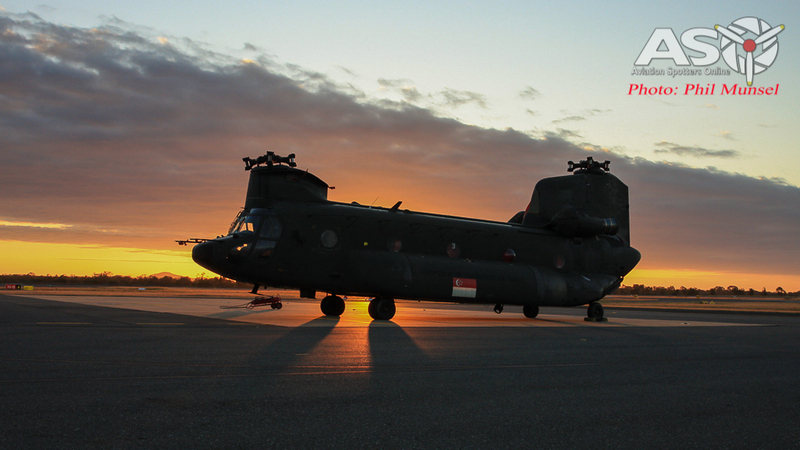 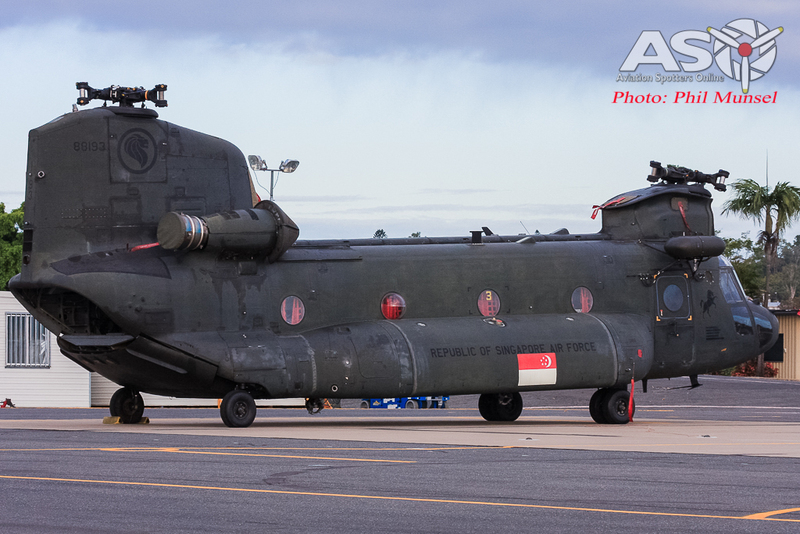 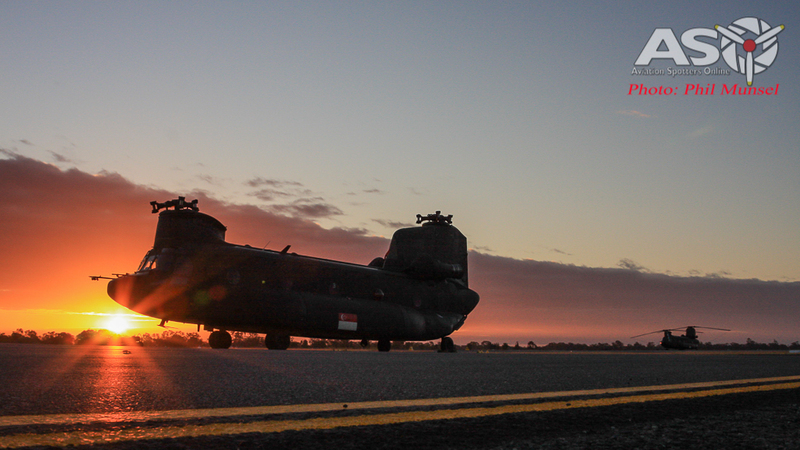 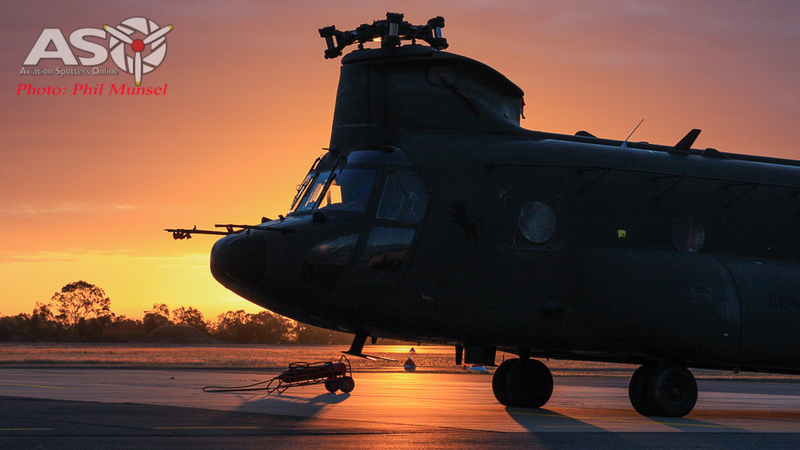 The sun sets behind a RSAF Chinook after a long day! 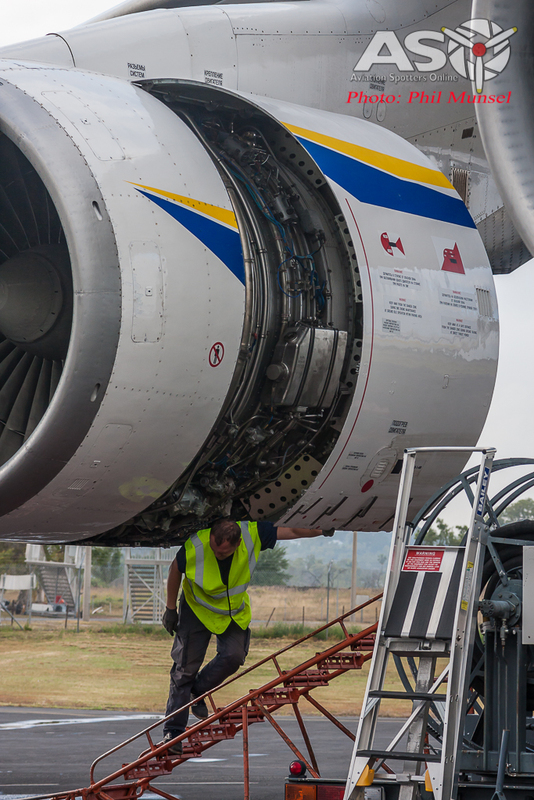 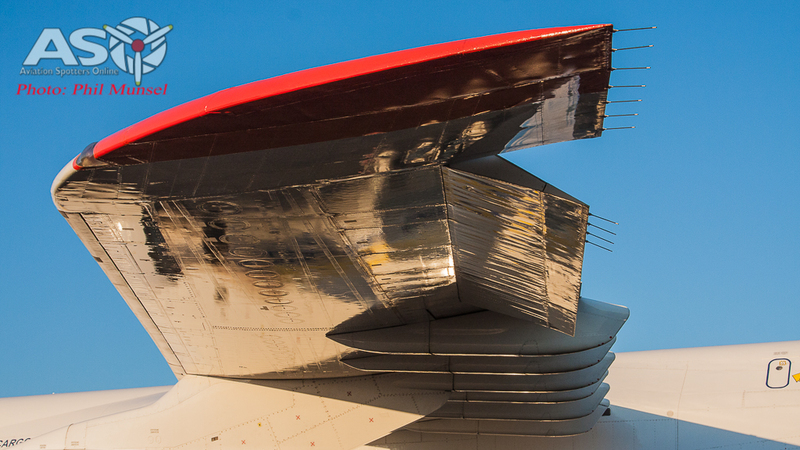 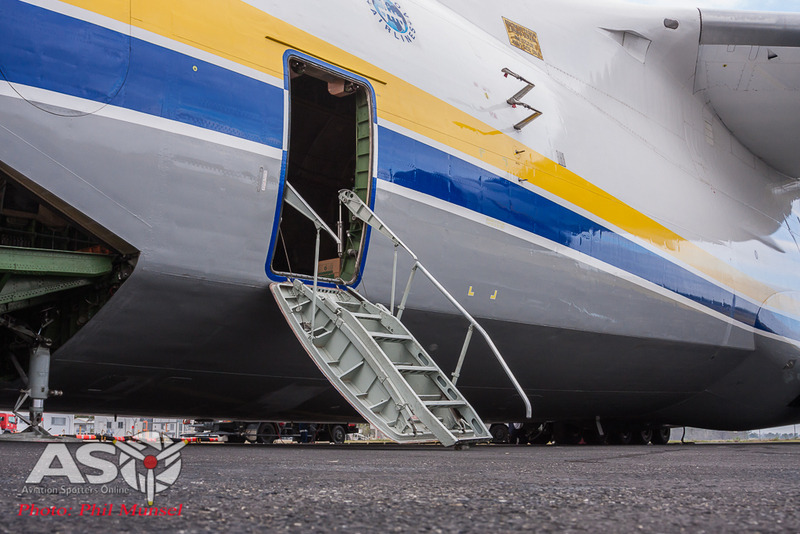 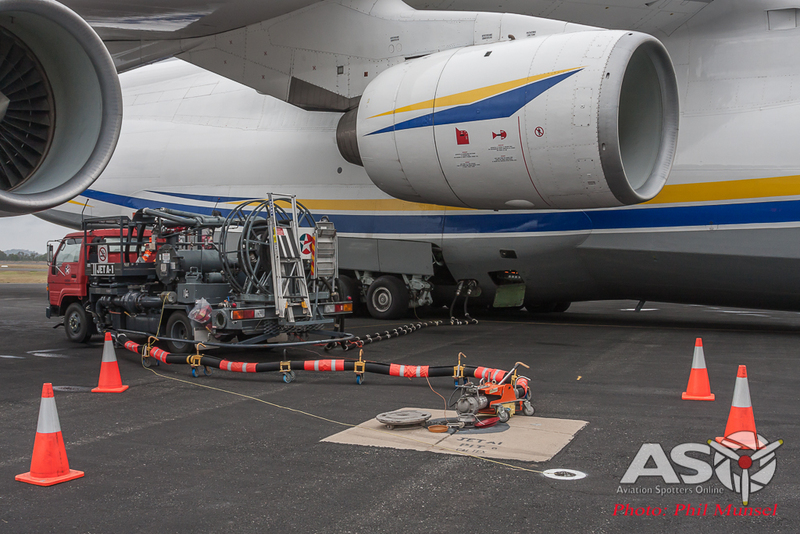 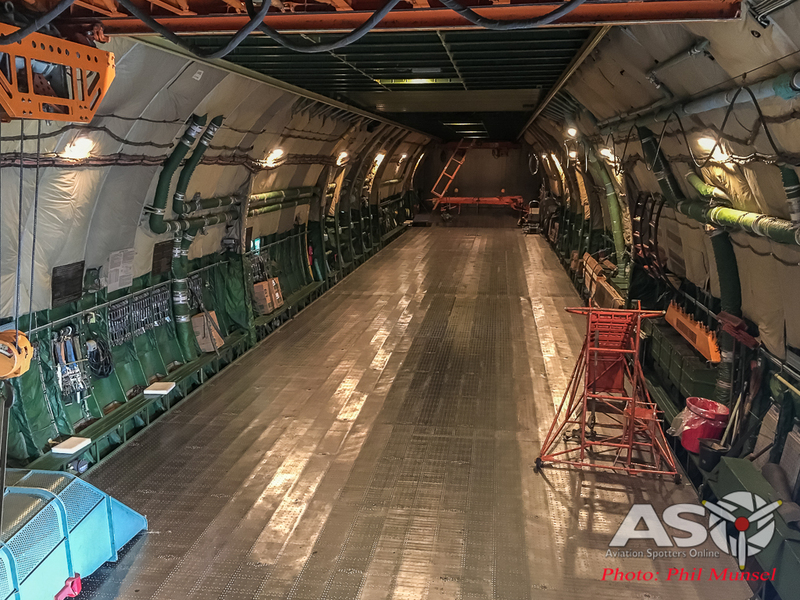 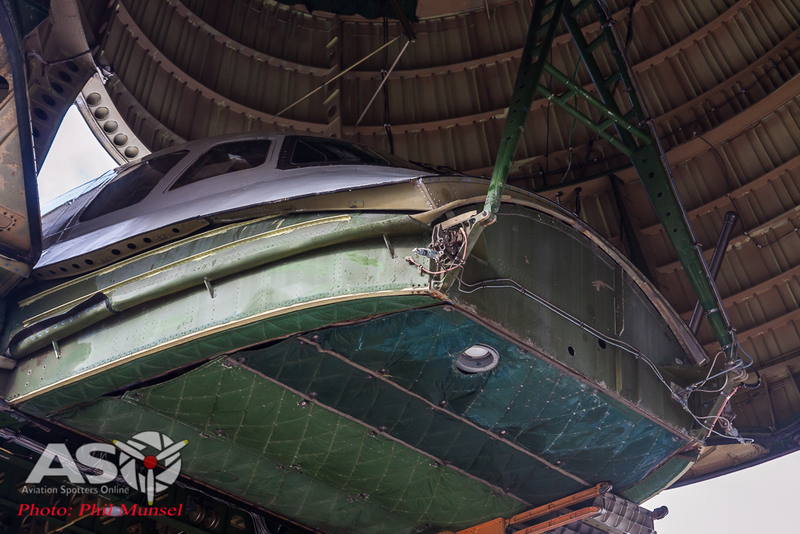 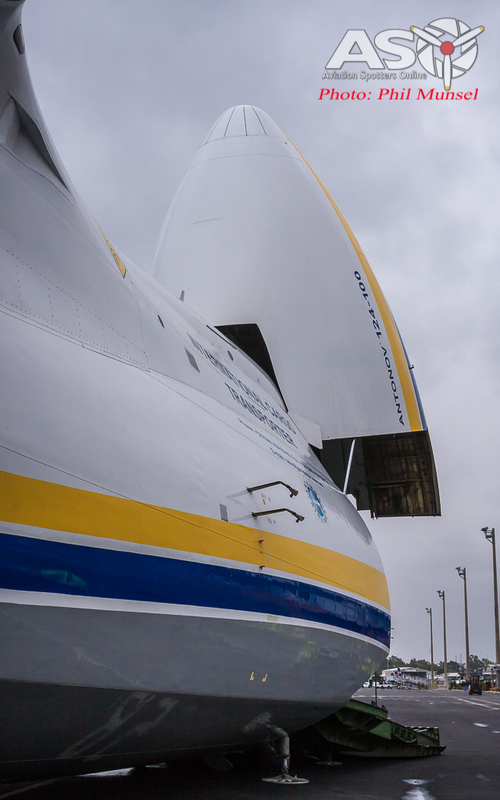 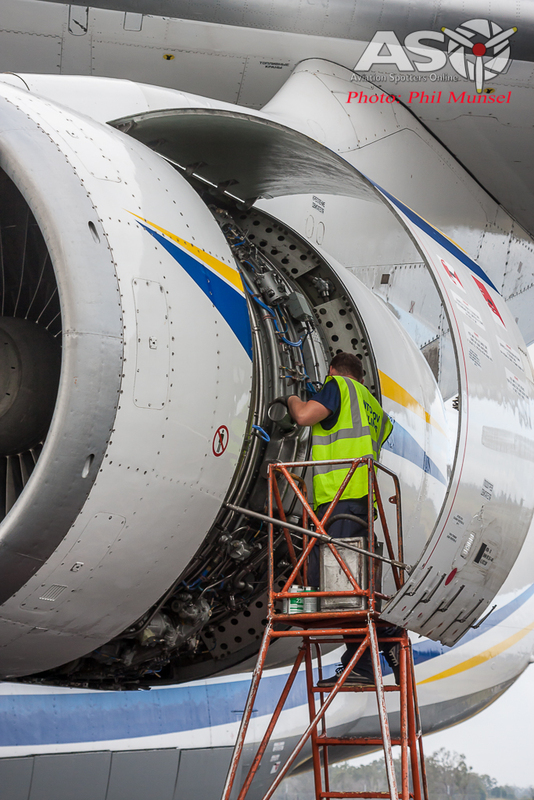 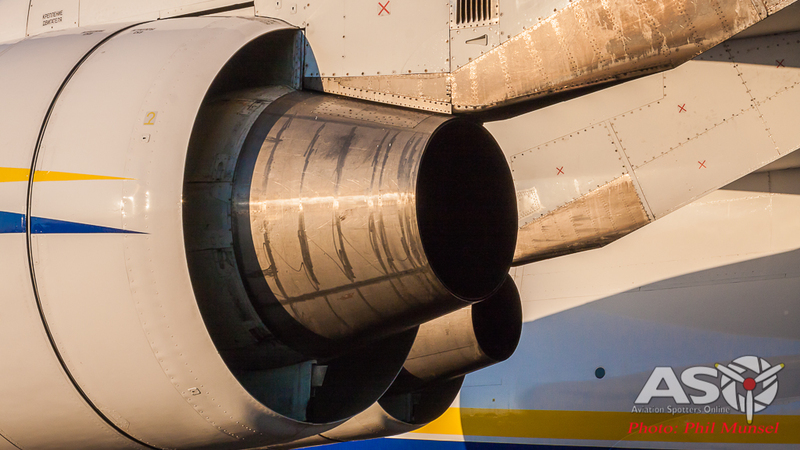 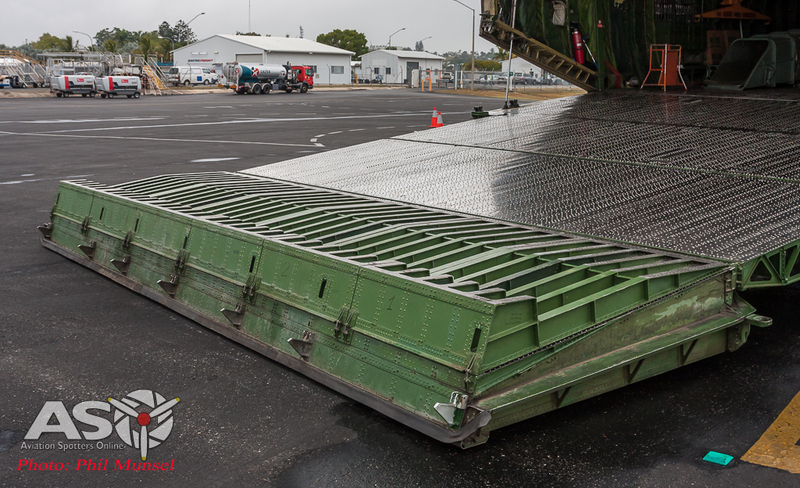 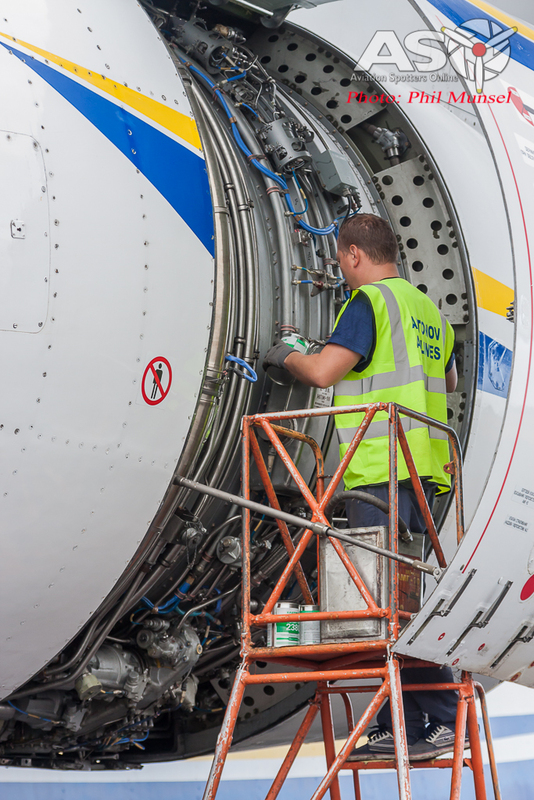 Finishing up a few of the smaller details before the An-124 is put to bed! 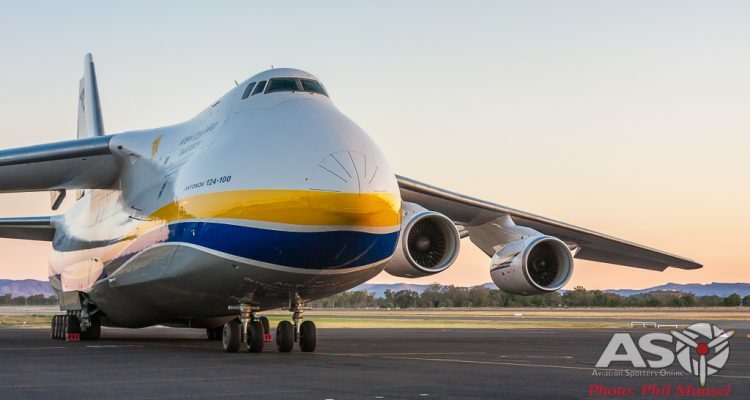 Hopefully I have snagged some images to show you how big and wondrous this aircraft really is with its 73m wingspan, nearly 69m length and nearly 21m tail height!